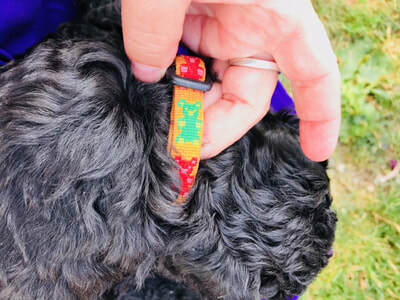 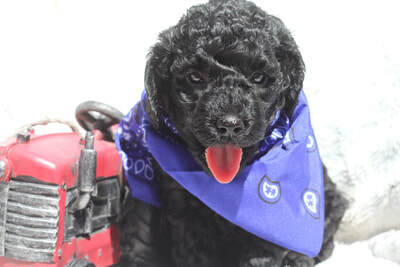 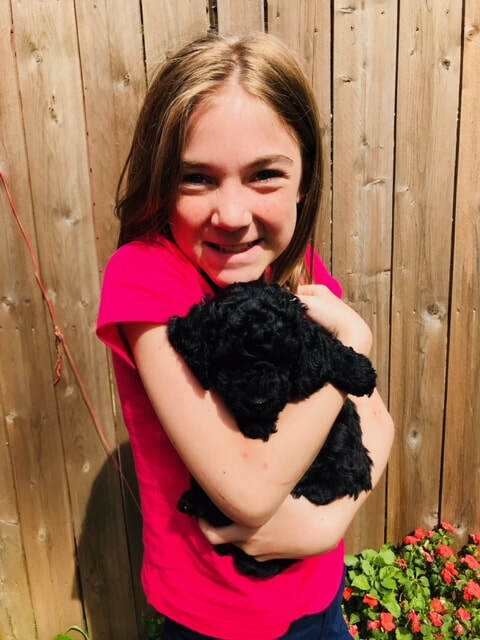 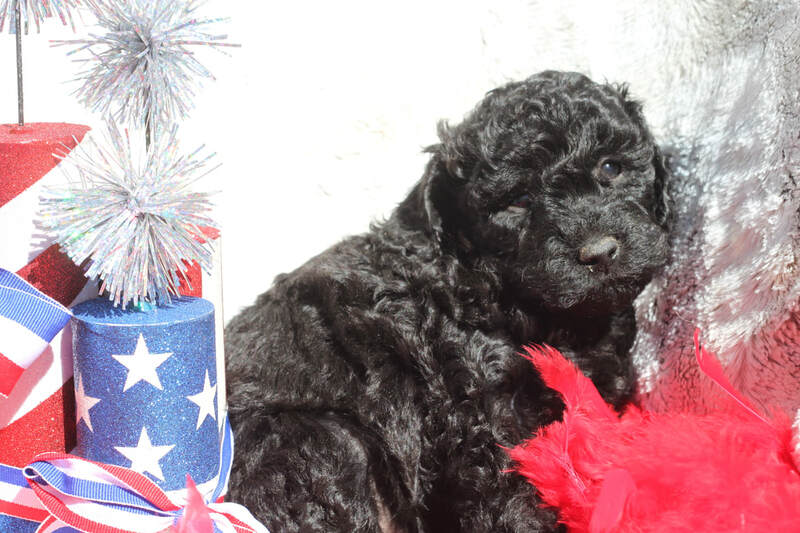 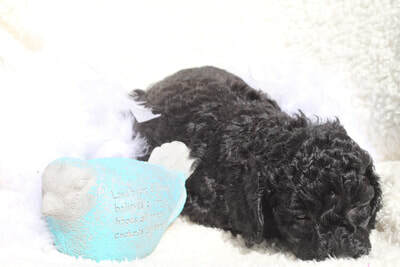 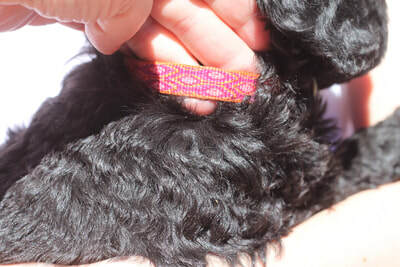 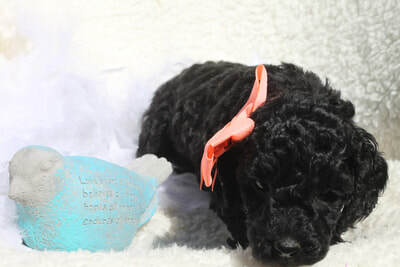 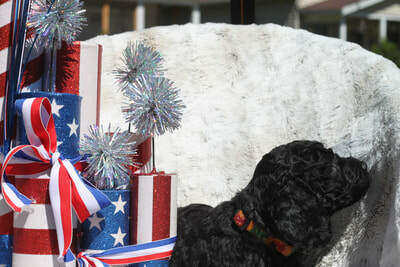 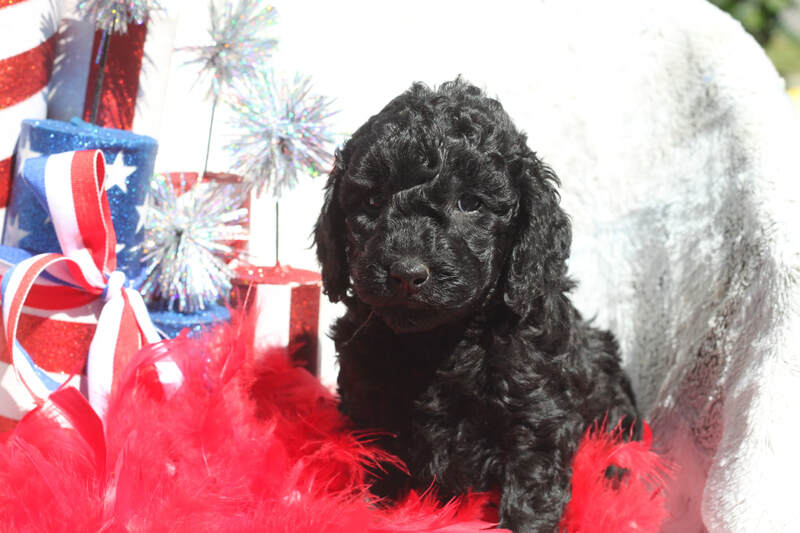 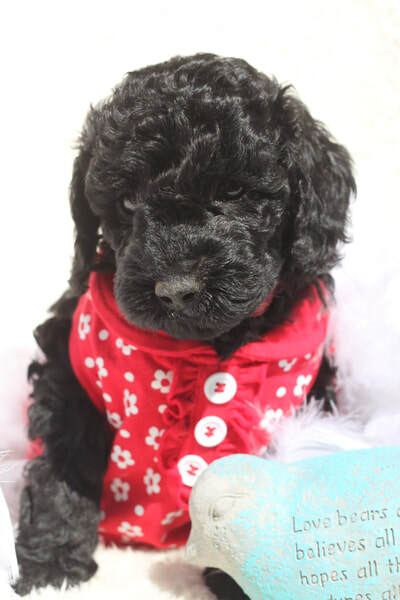 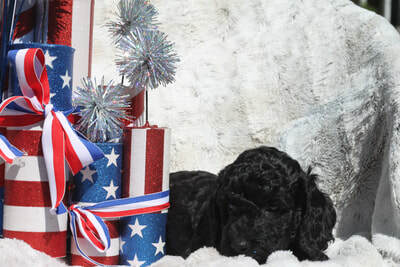 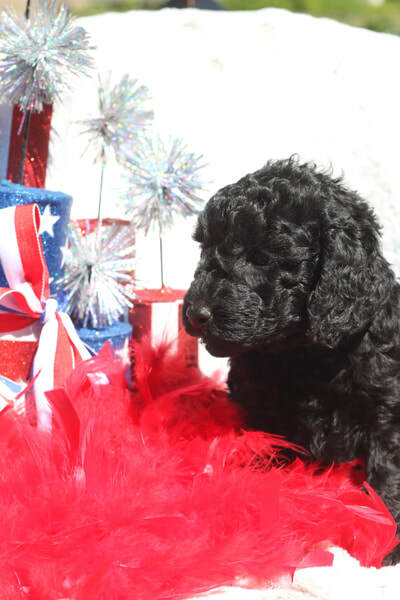 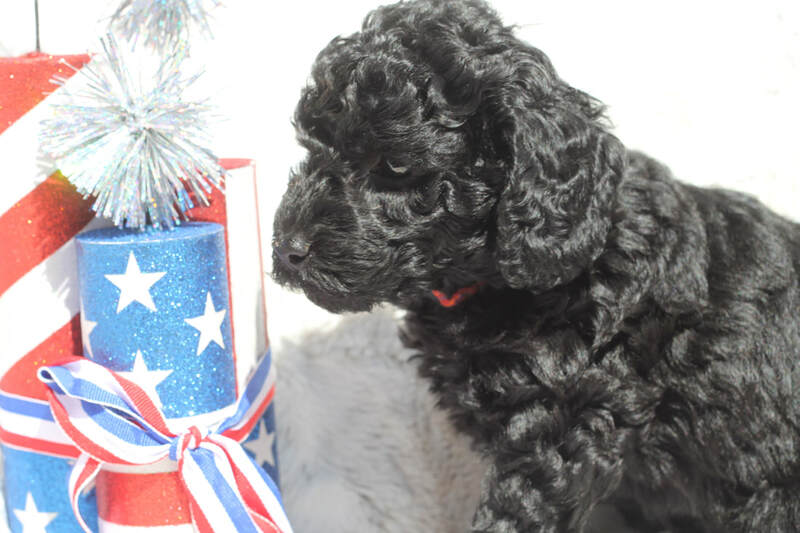 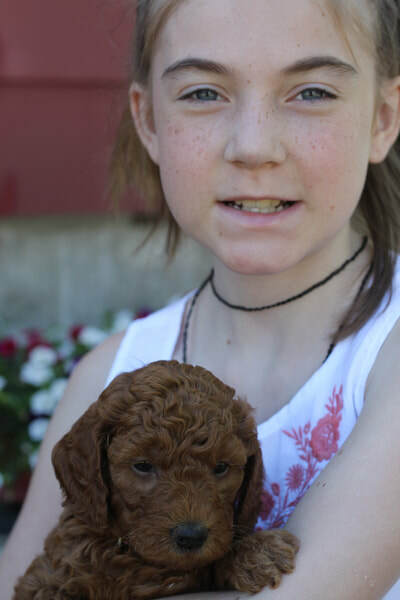 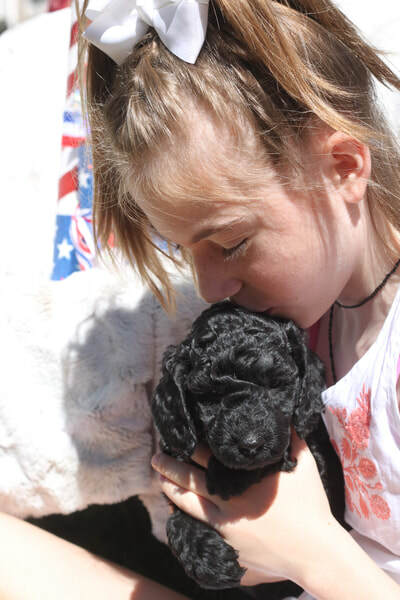 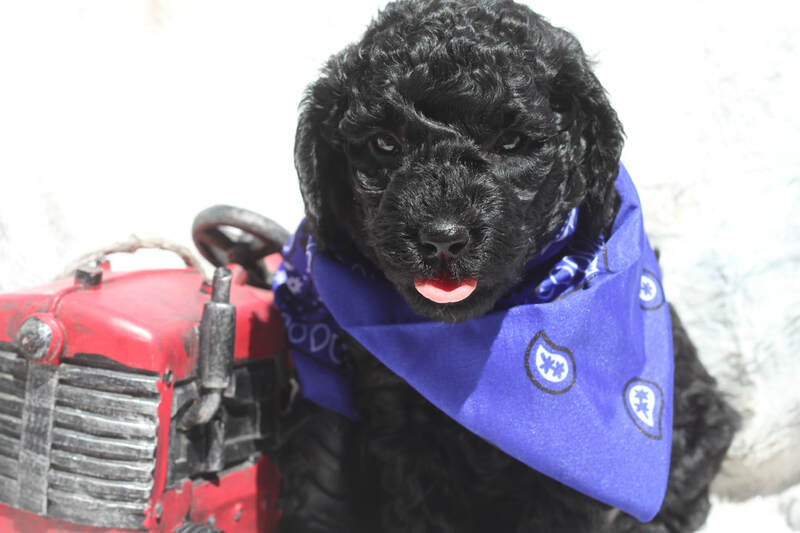 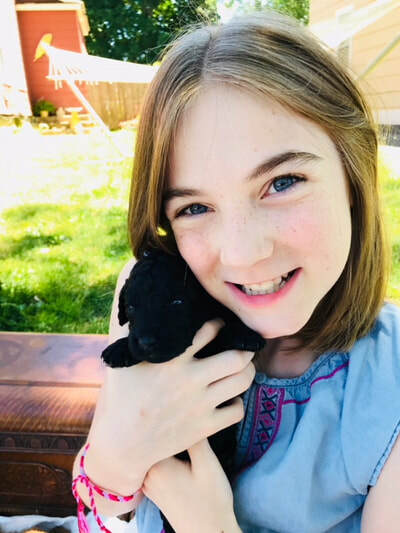 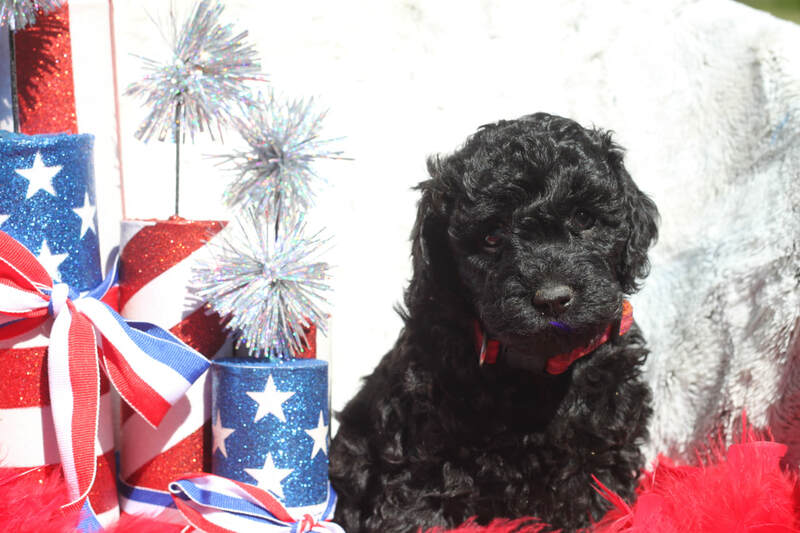 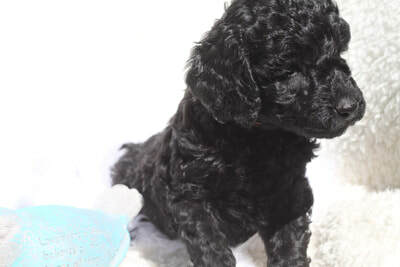 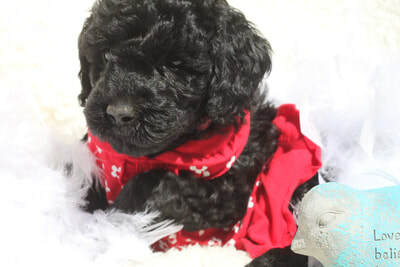 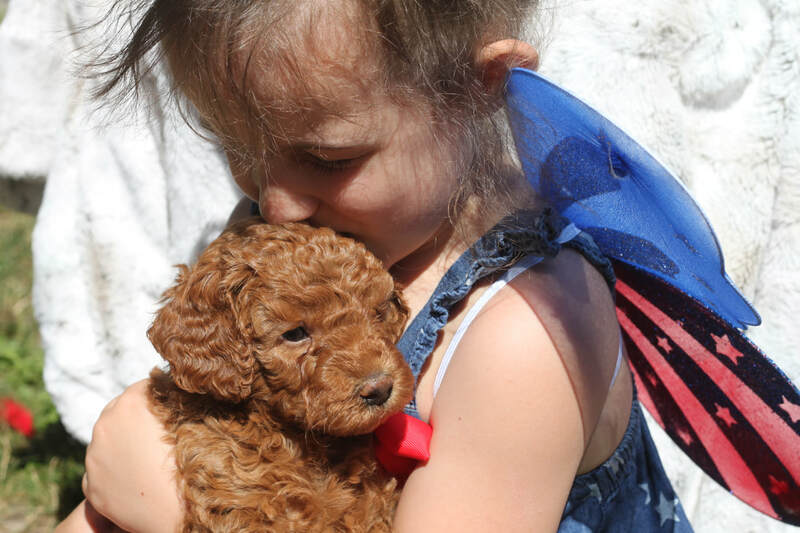 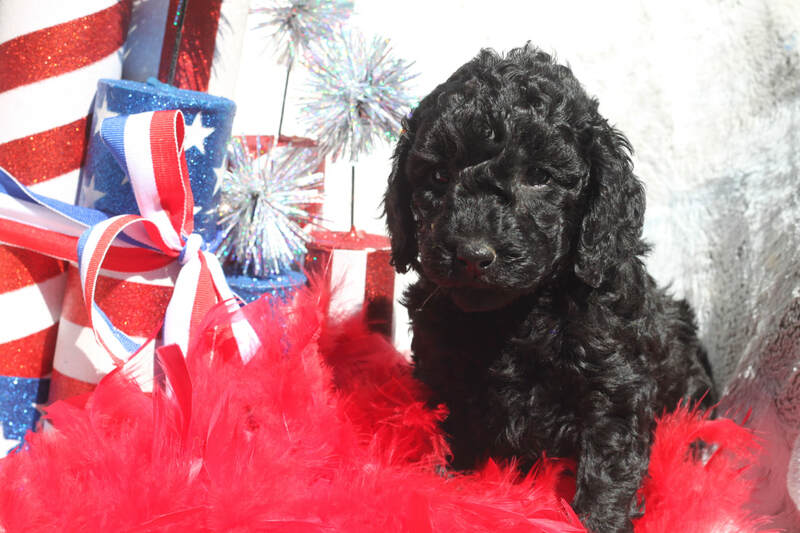 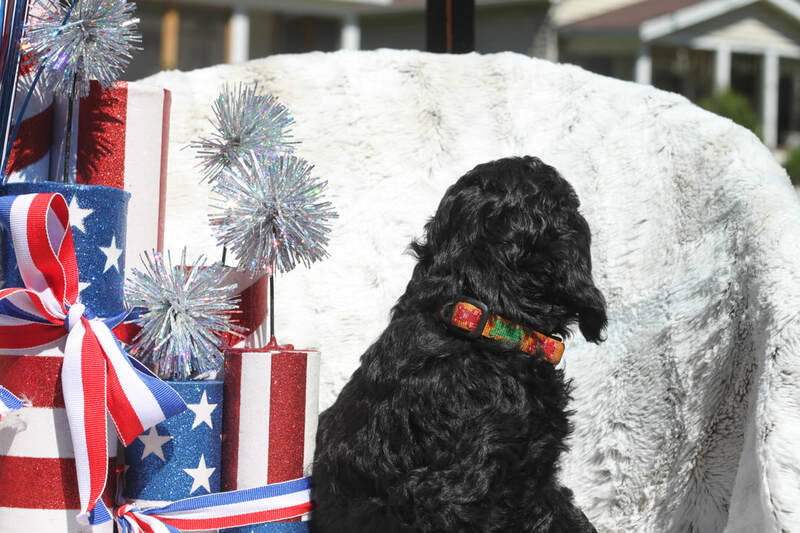 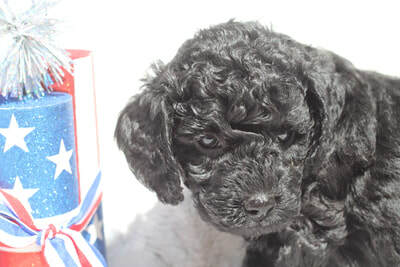 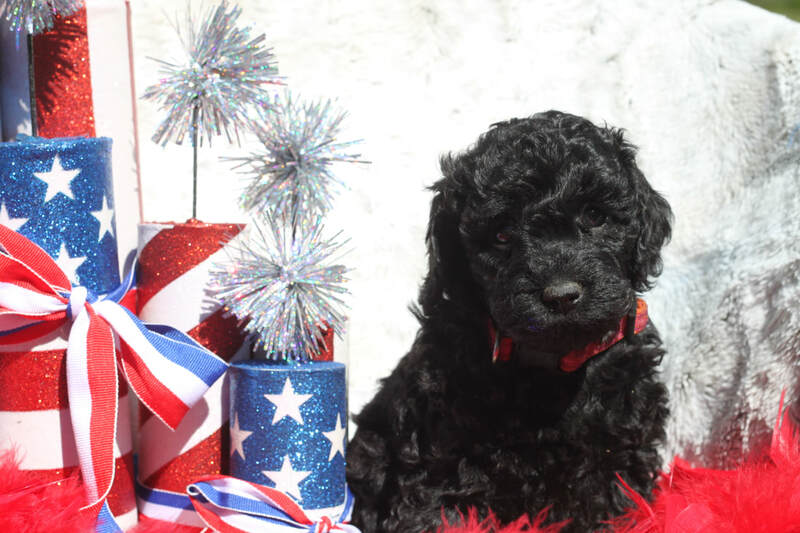 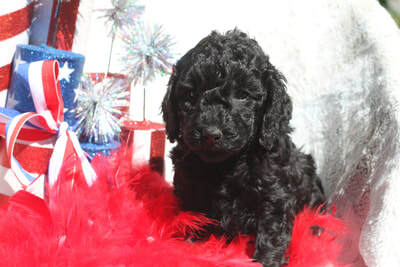 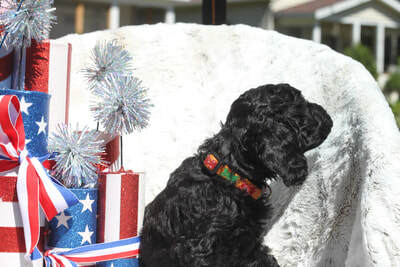 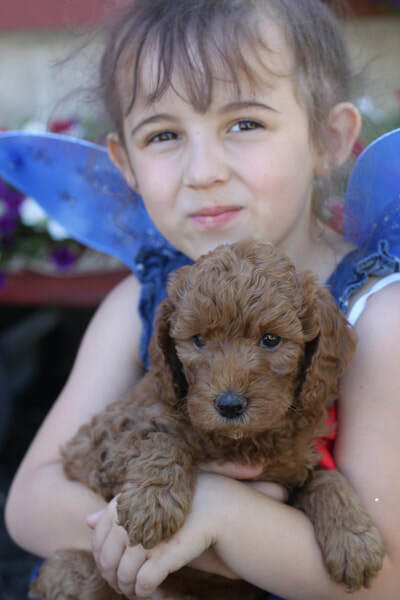 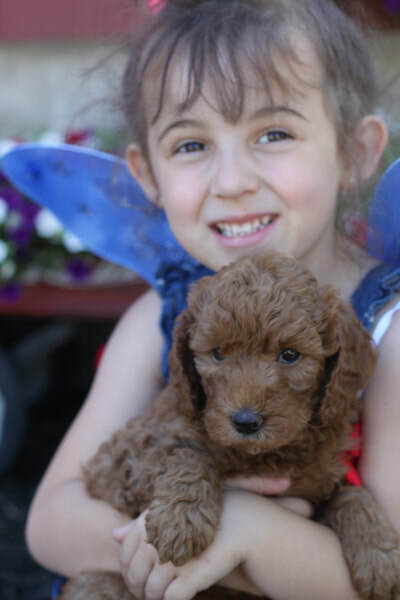 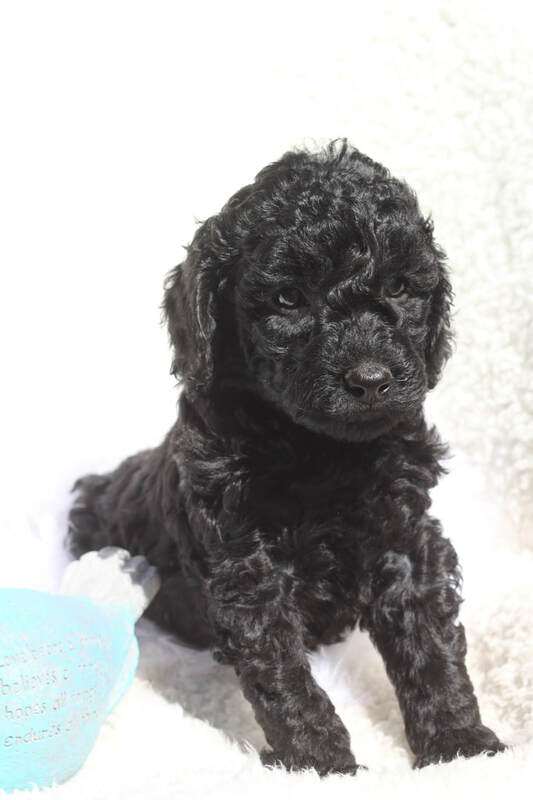 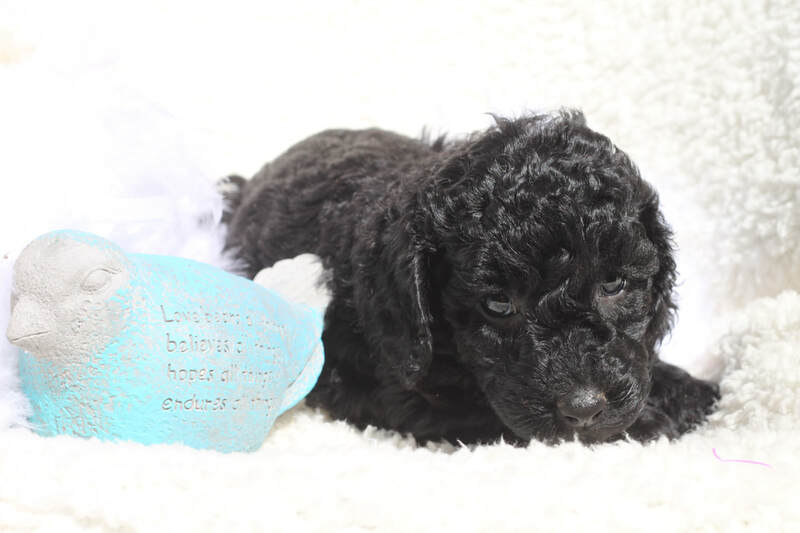 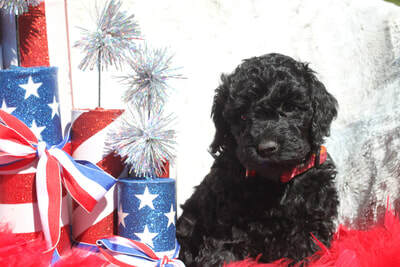 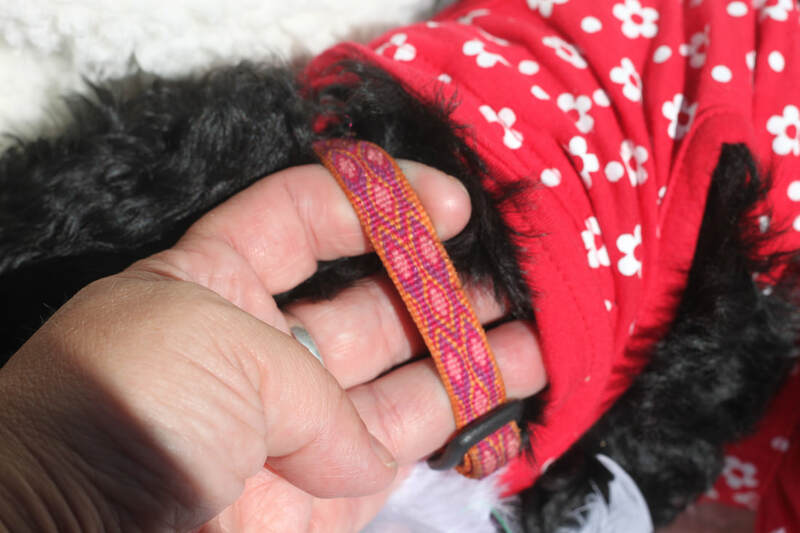 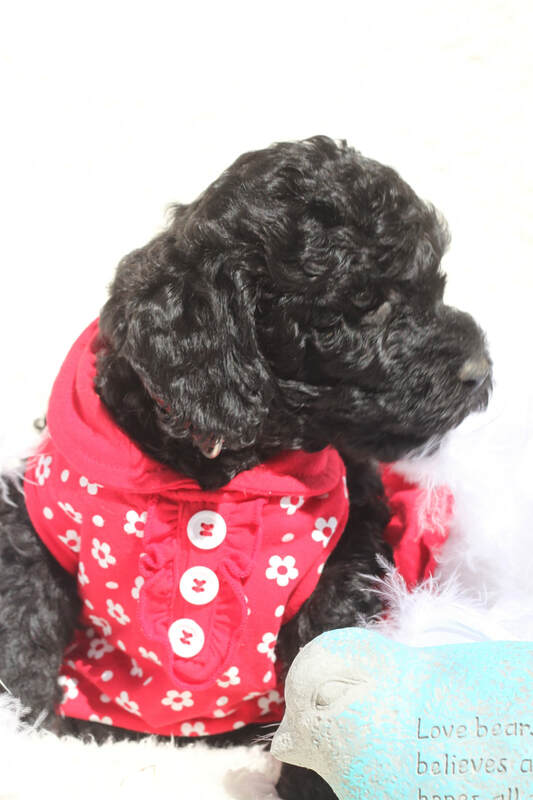 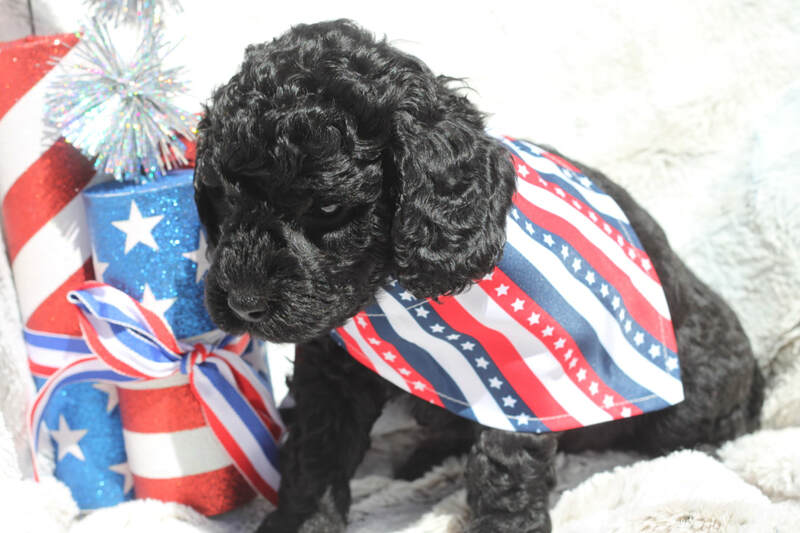 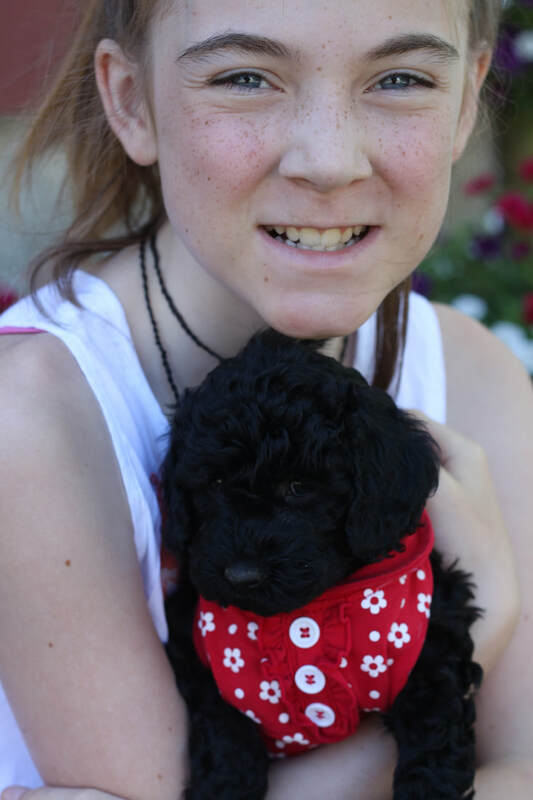 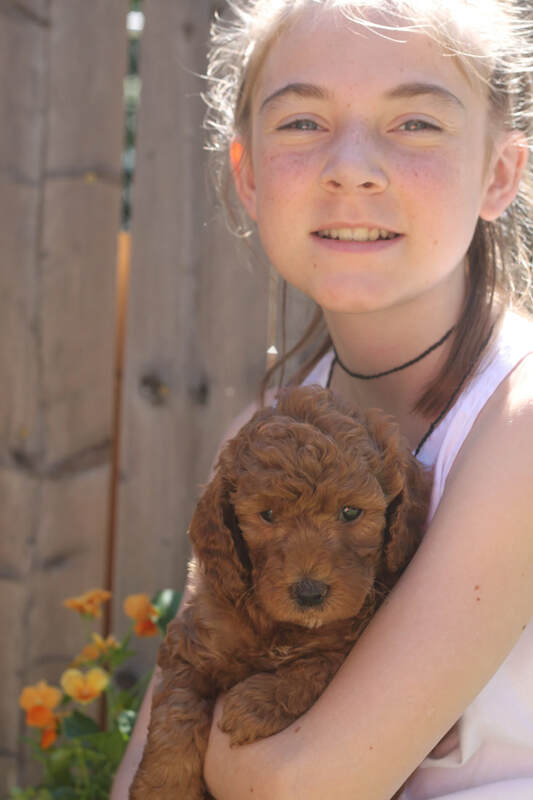 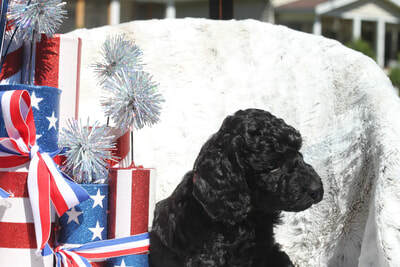 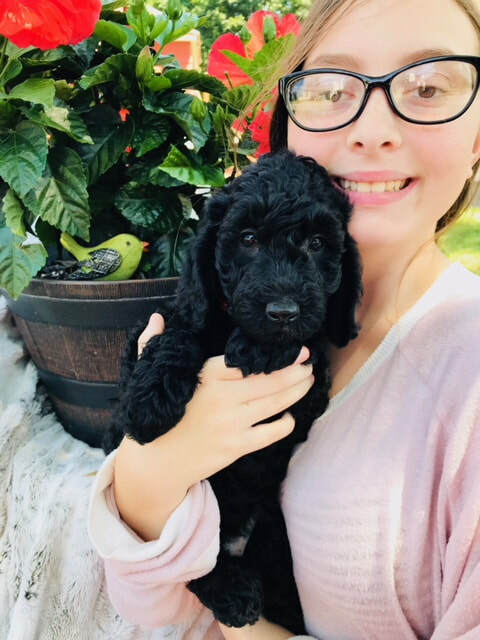 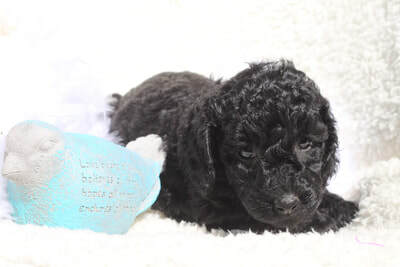 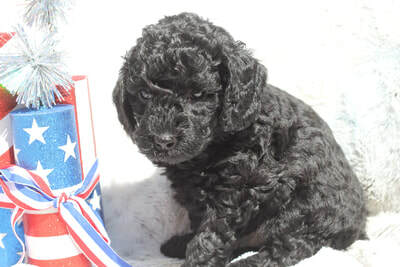 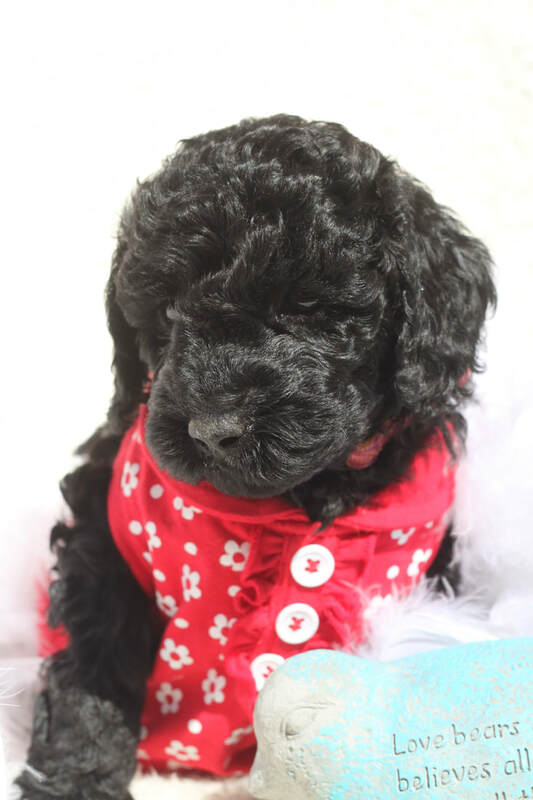 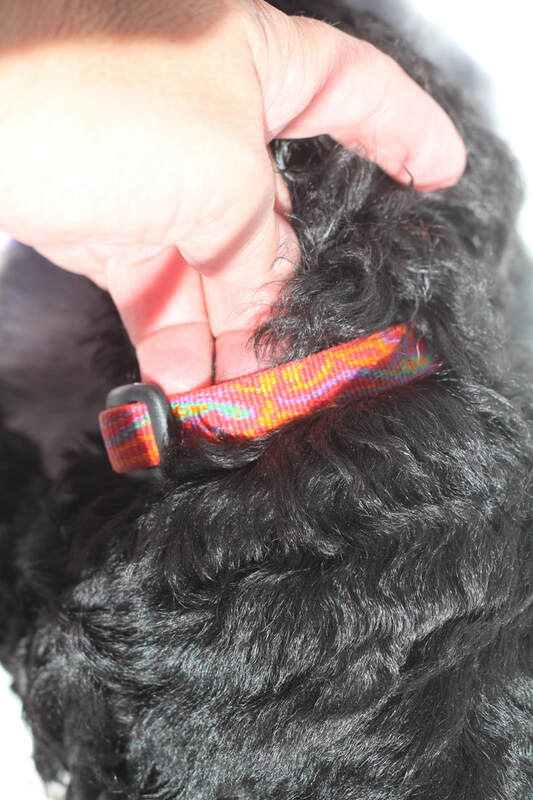 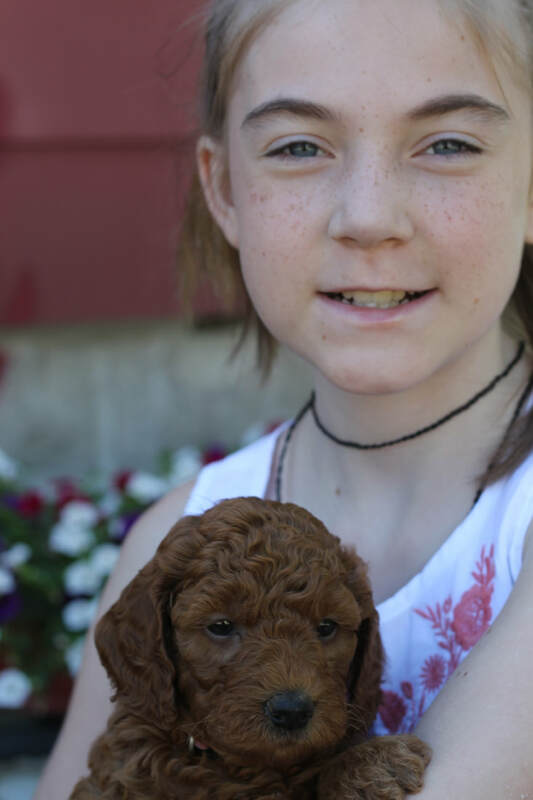 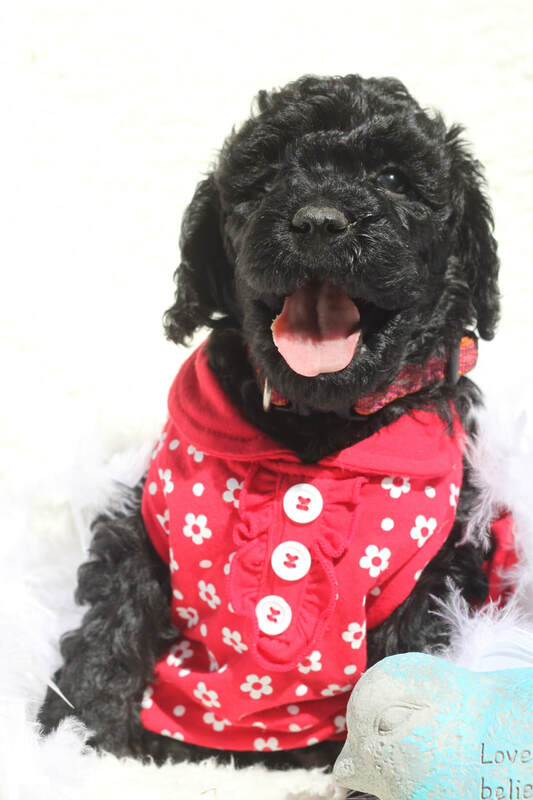 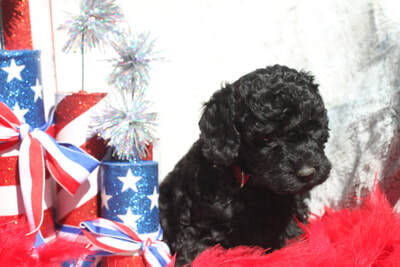 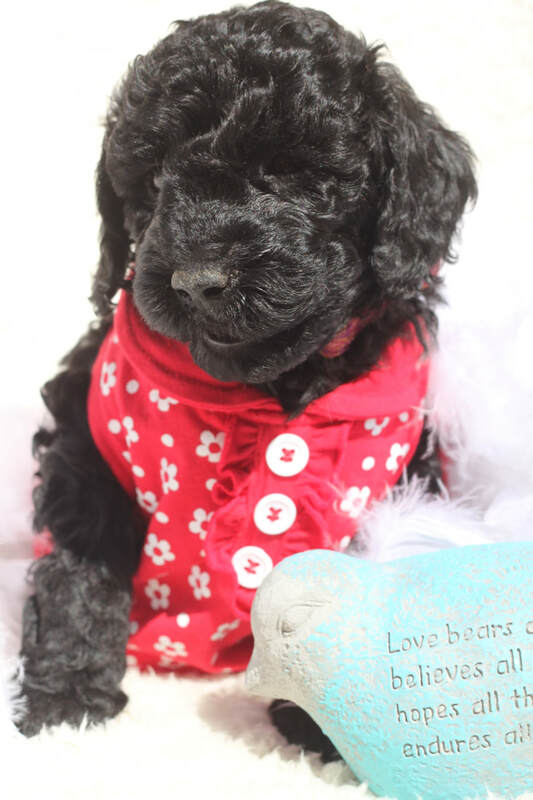 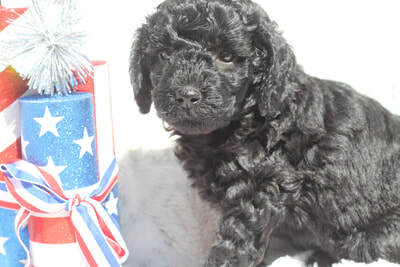 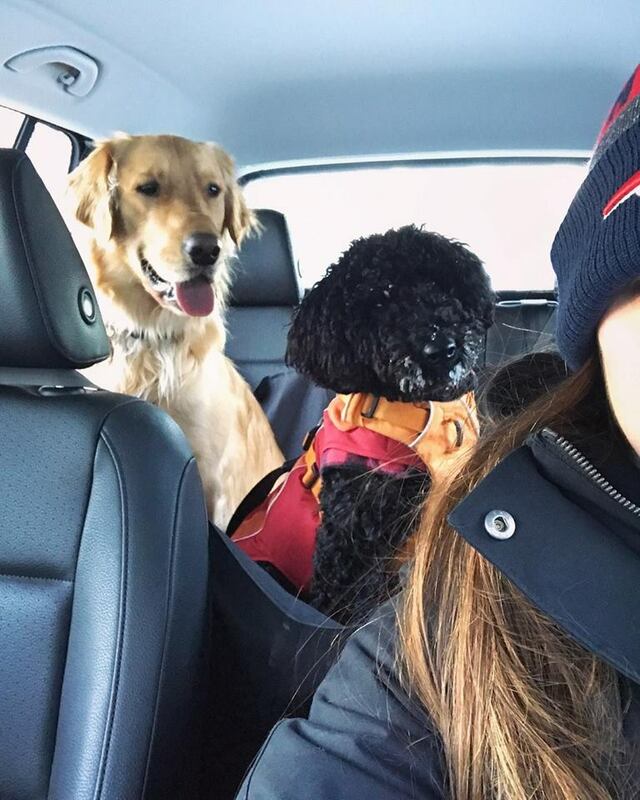 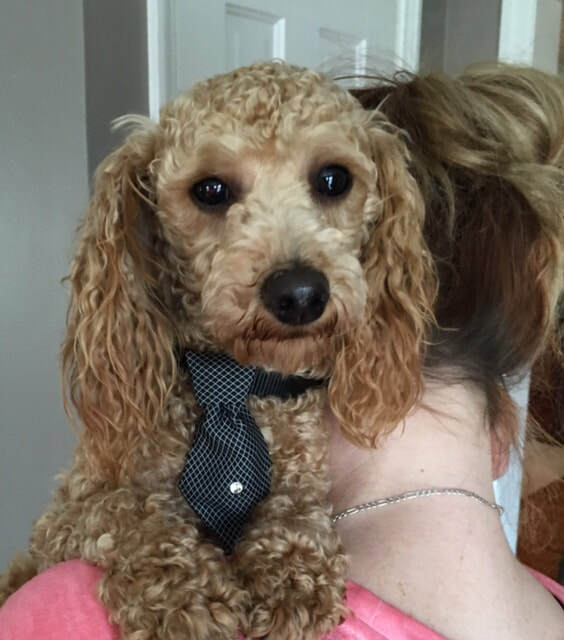 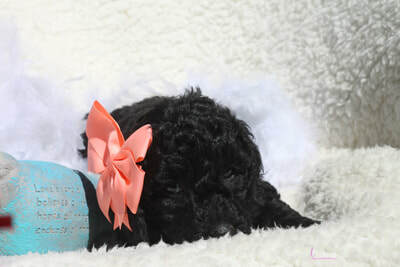 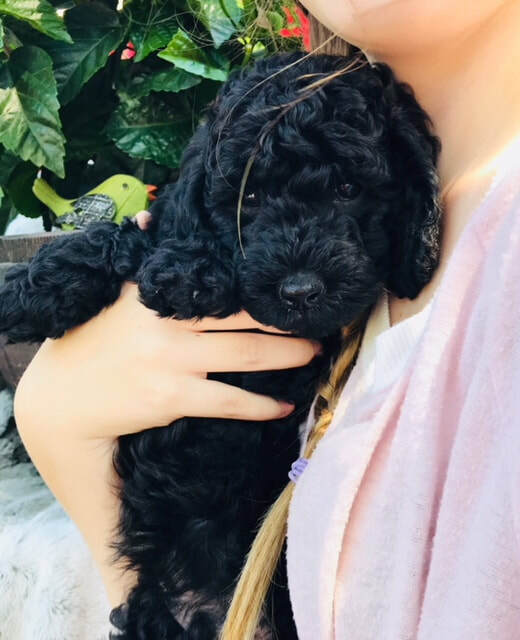 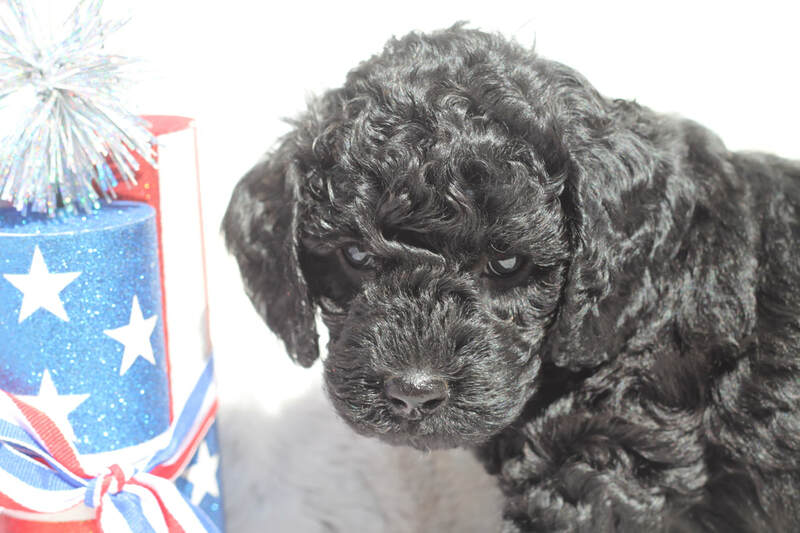 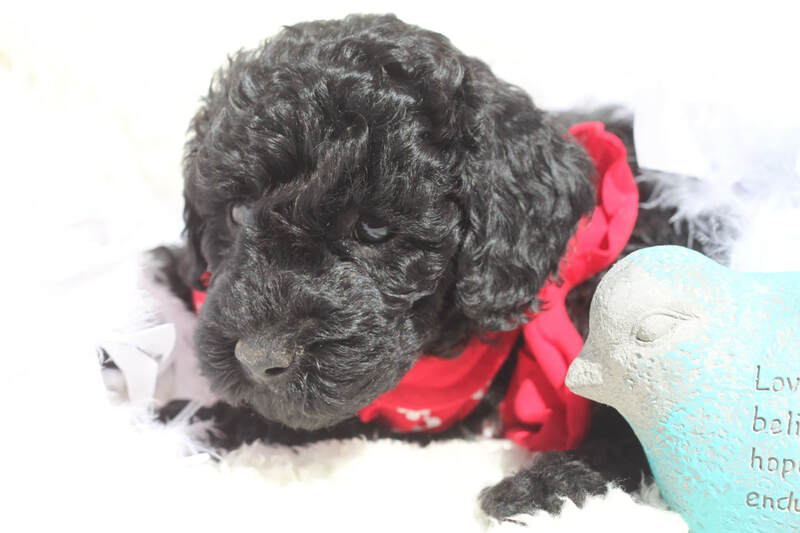 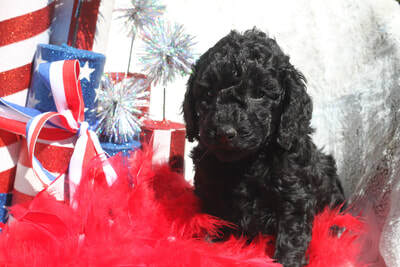 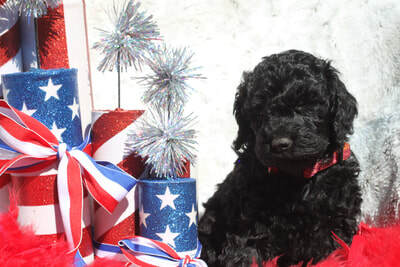 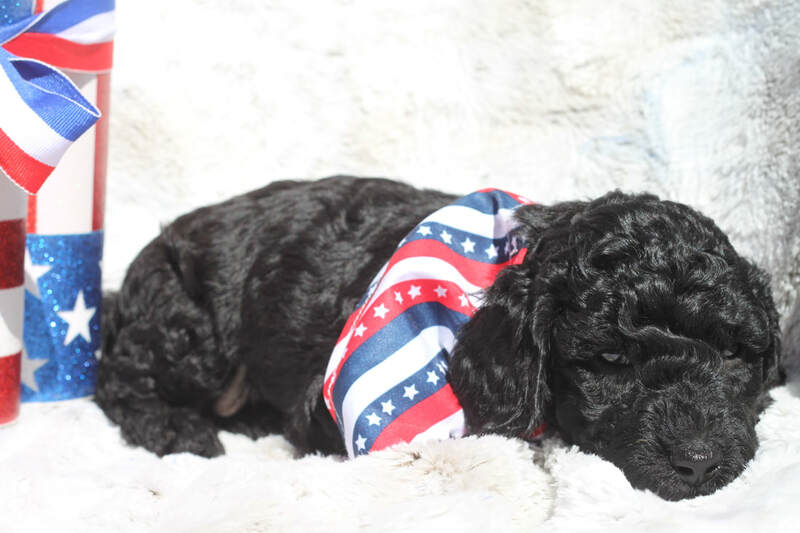 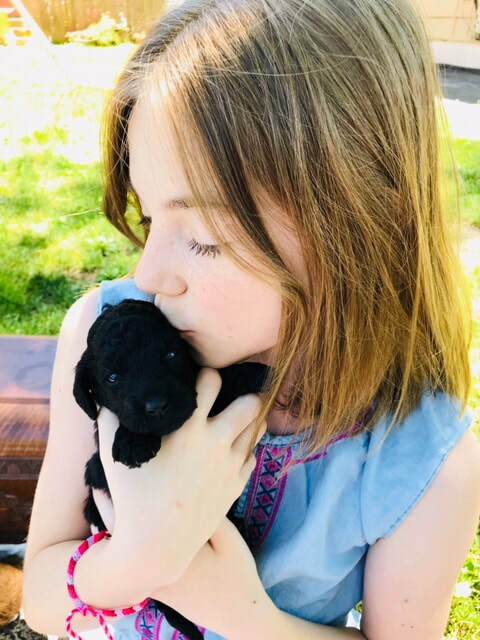 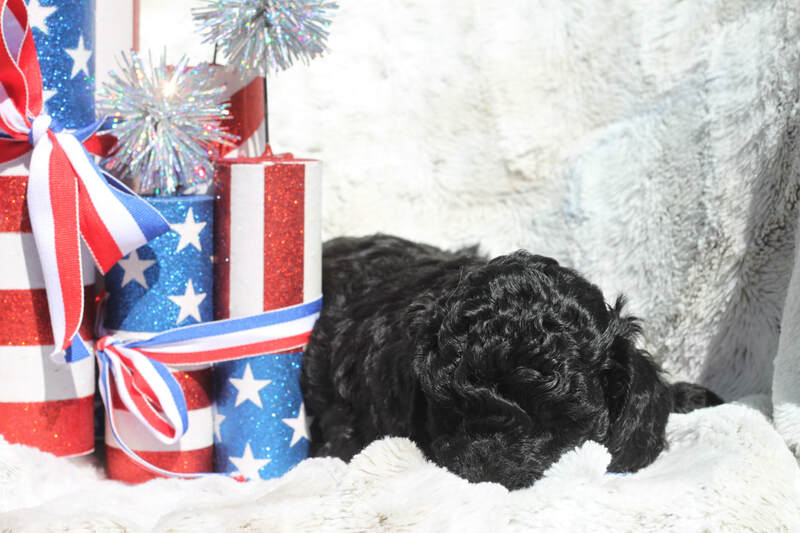 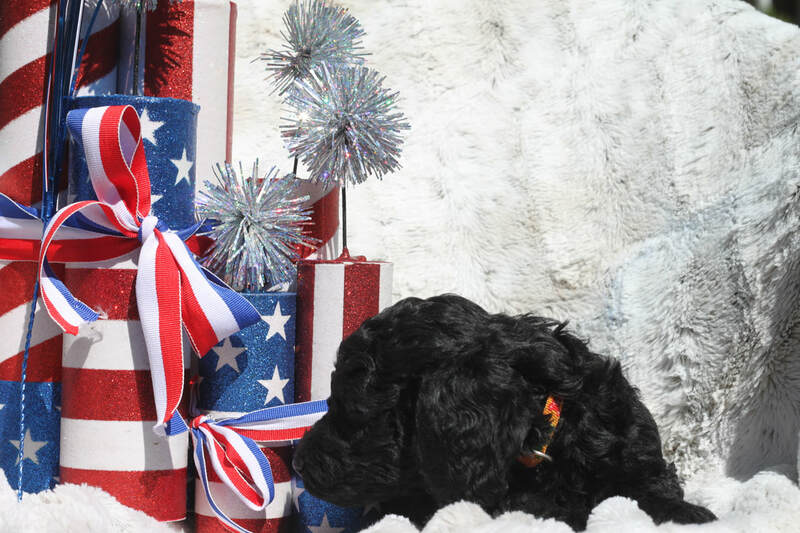 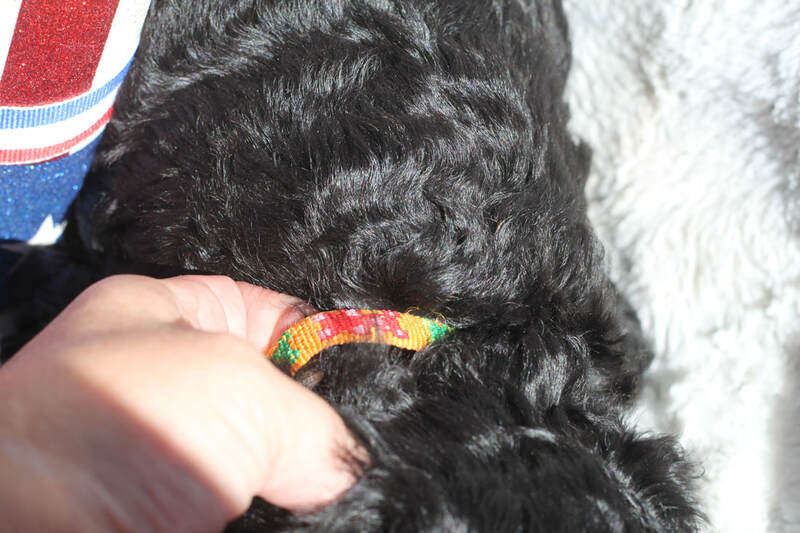 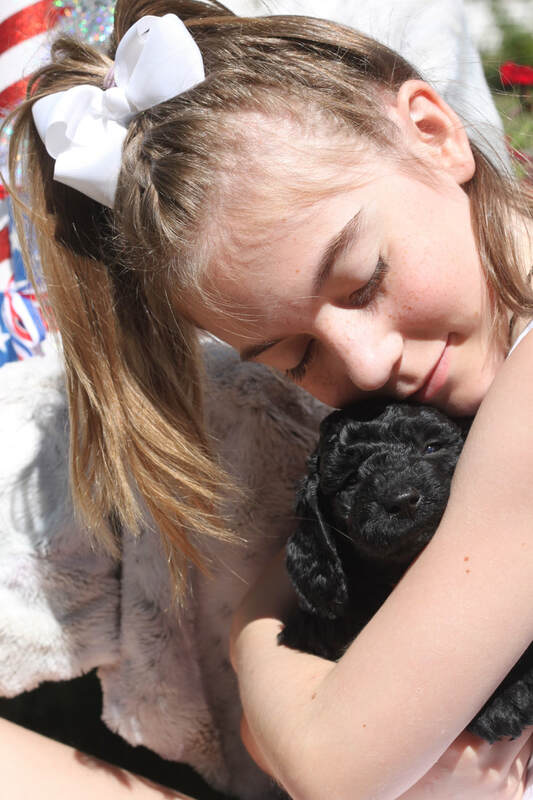 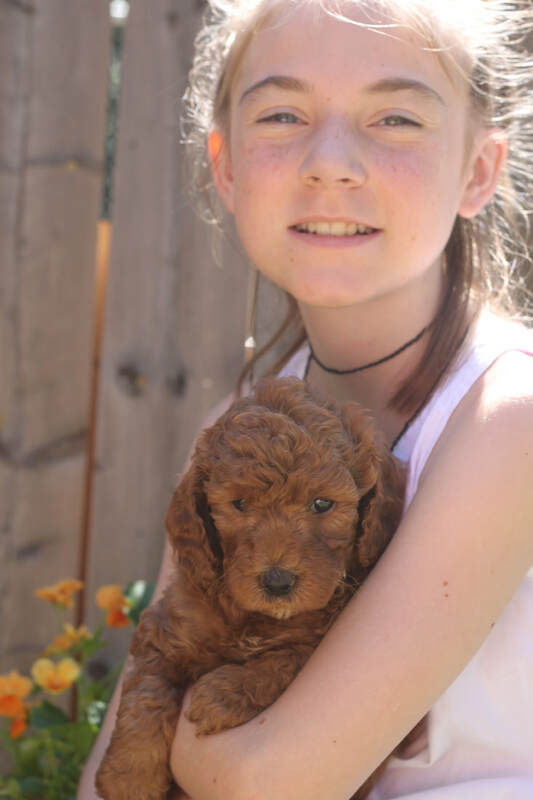 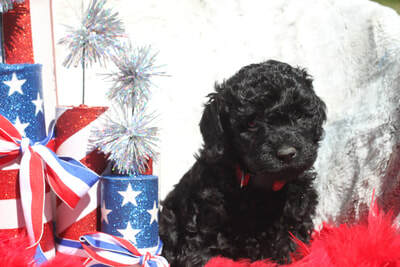 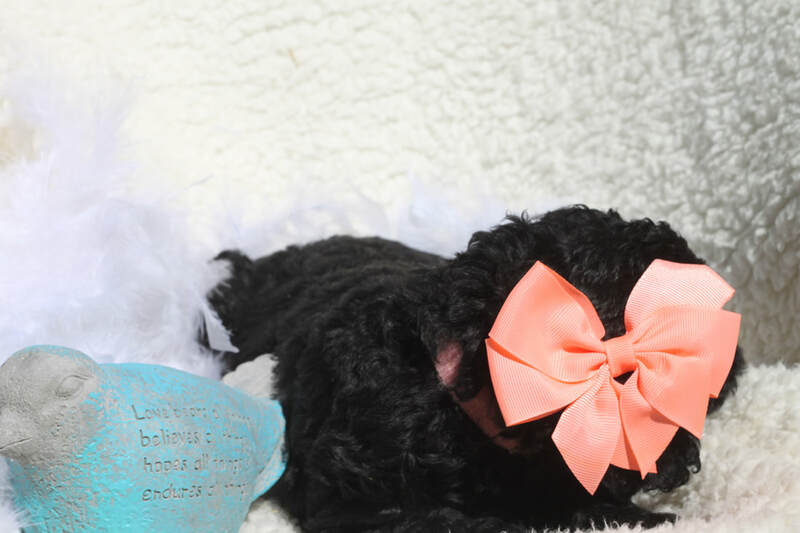 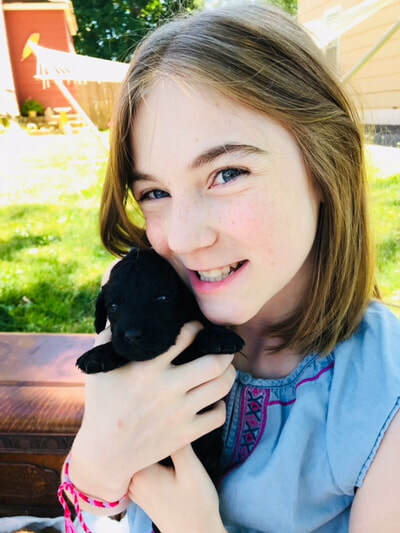 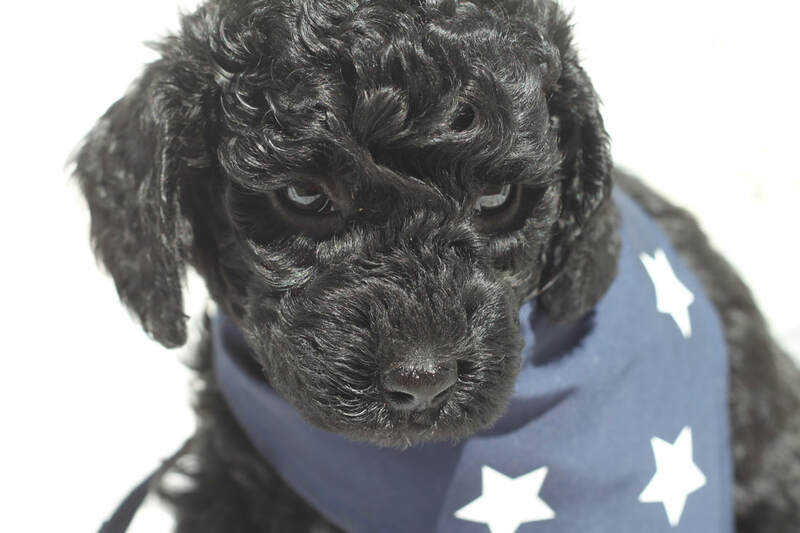 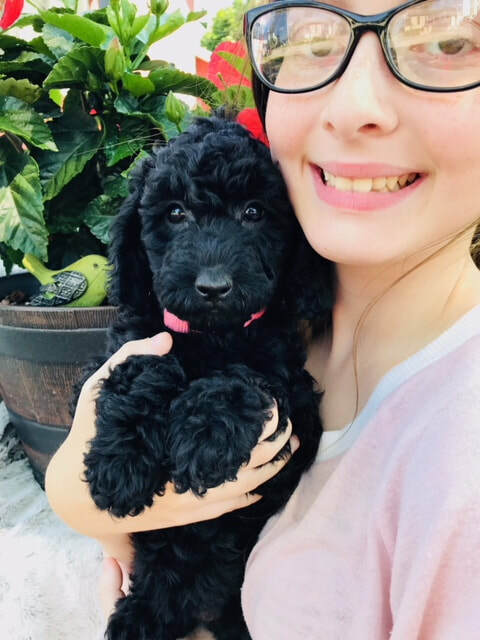 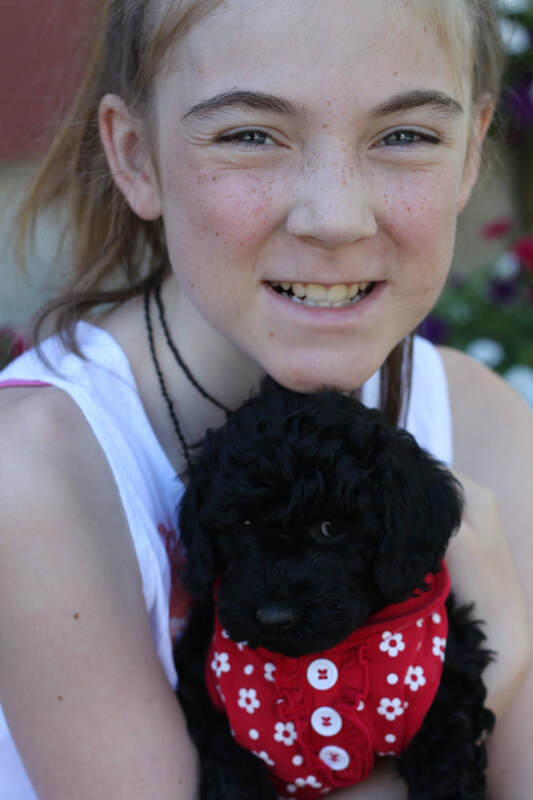 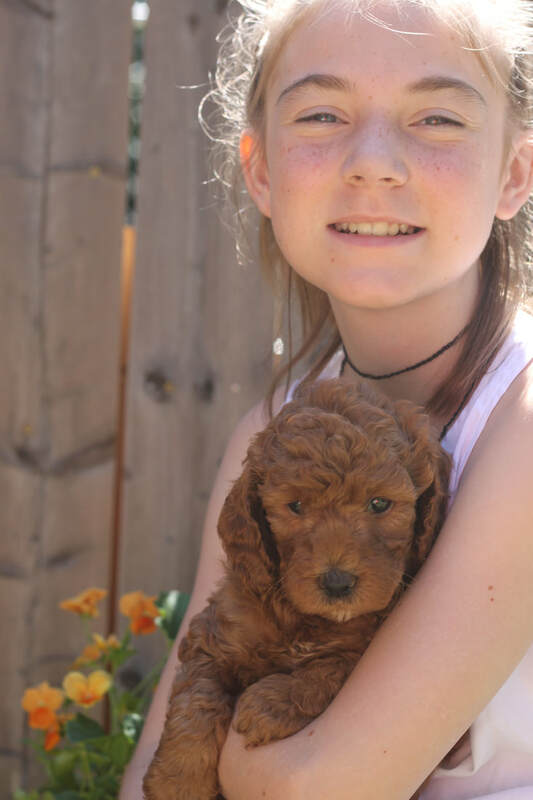 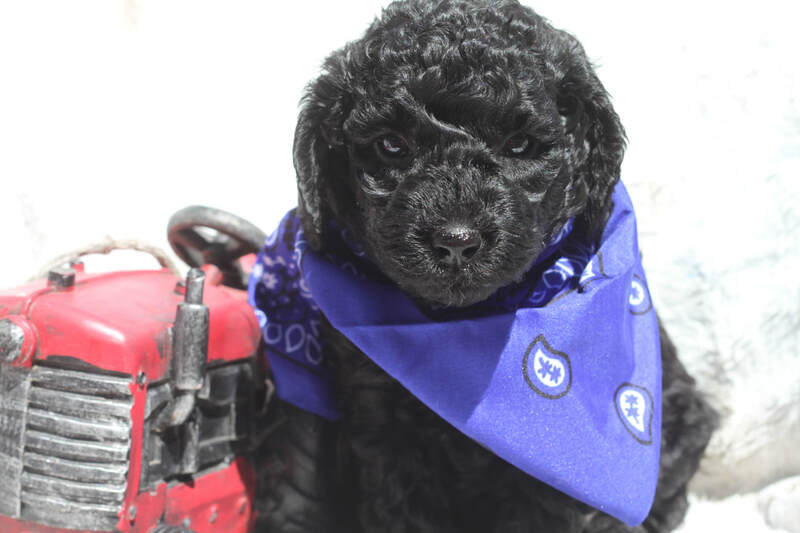 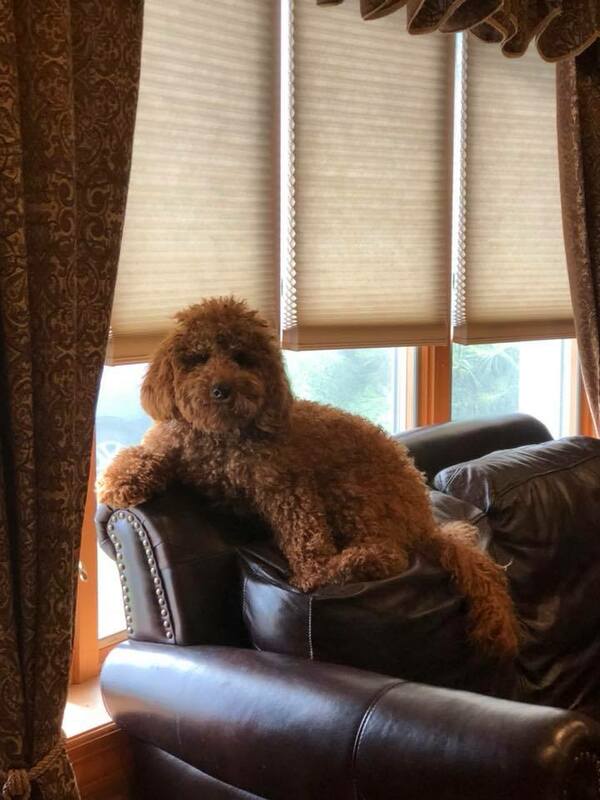 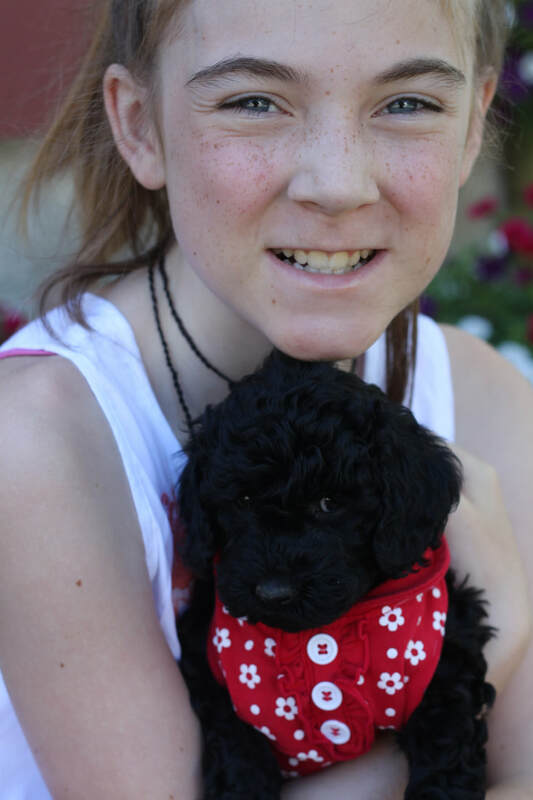 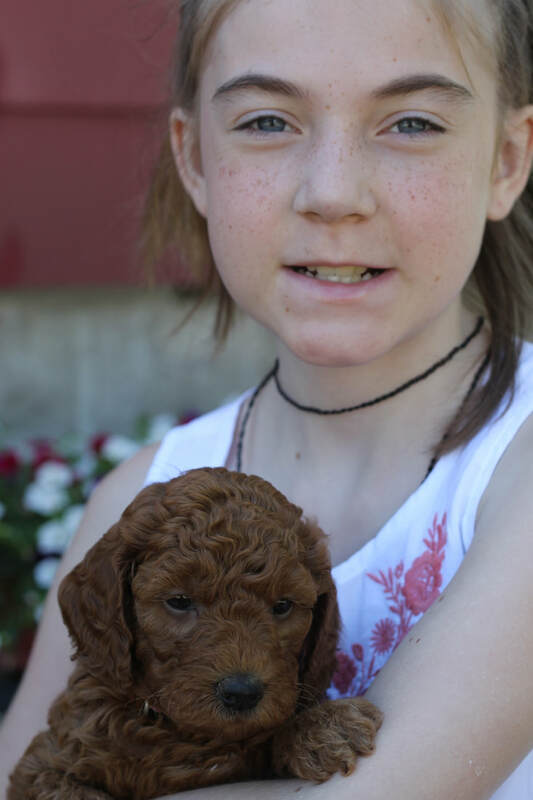 Bailey B is a F1b black Goldendoodle that is about 35/40 lbs and Finnigan is a red, AKC mini poodle that is 12 lbs. 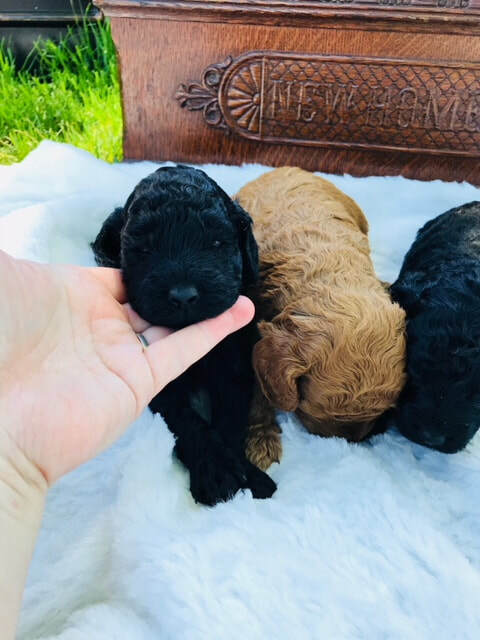 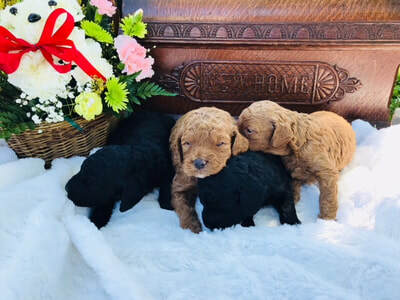 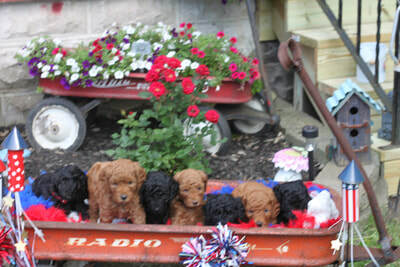 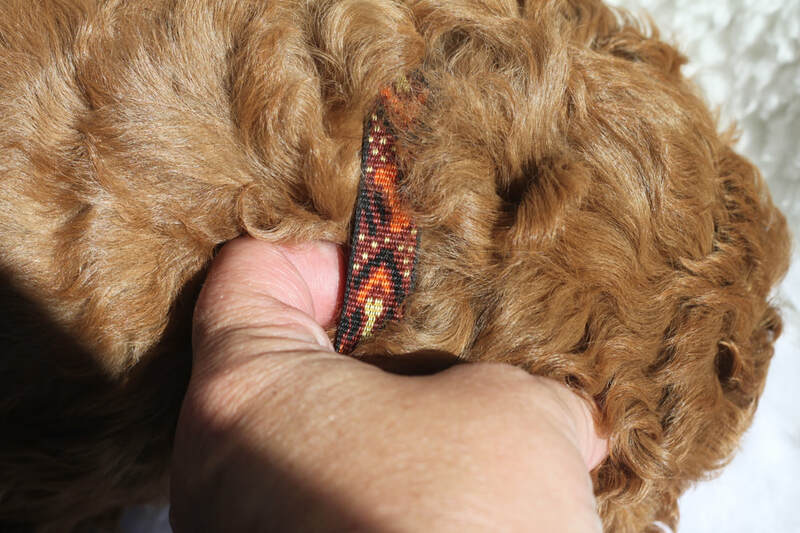 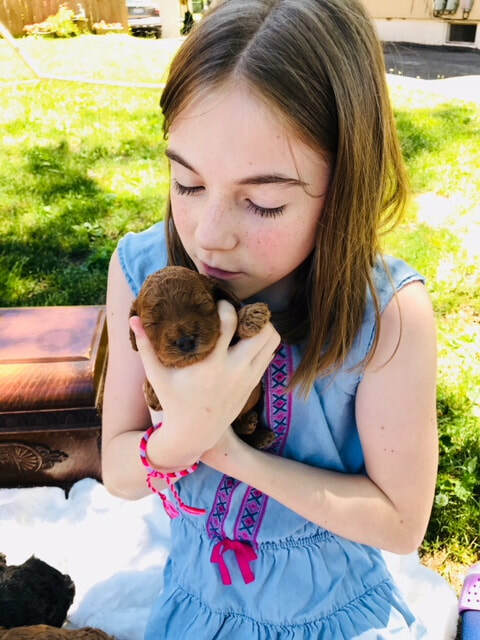 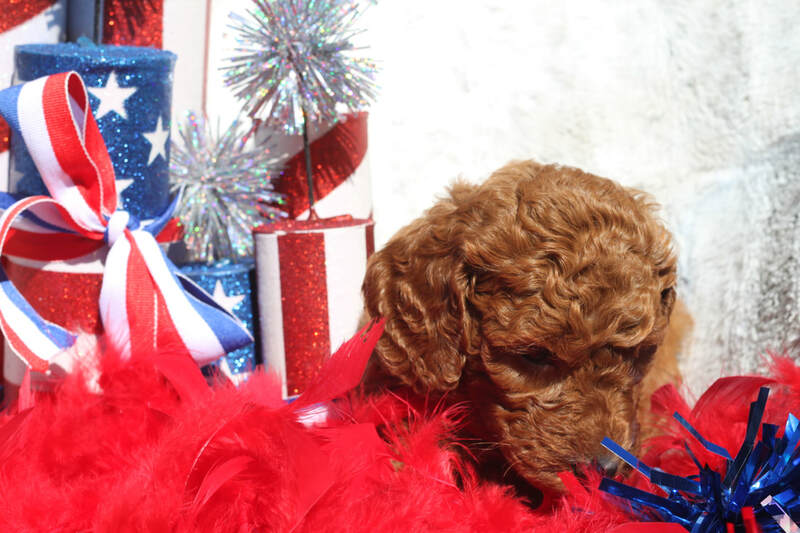 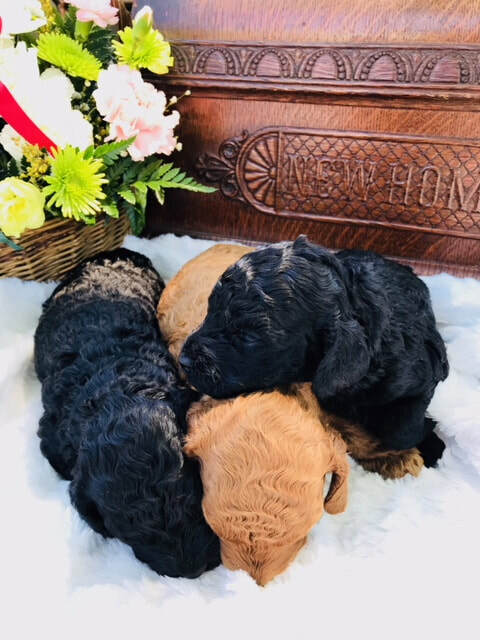 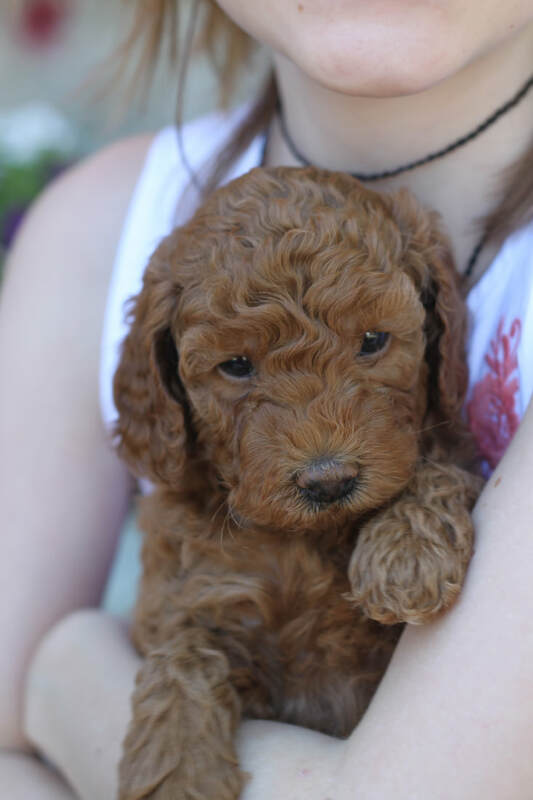 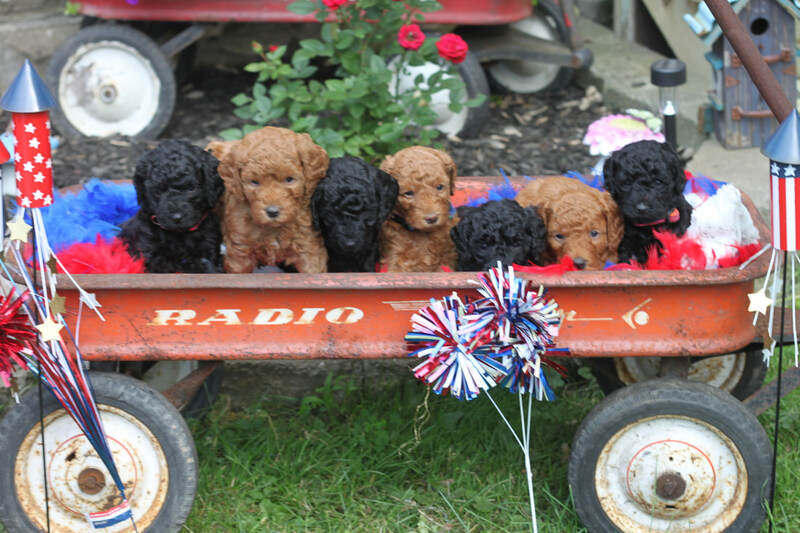 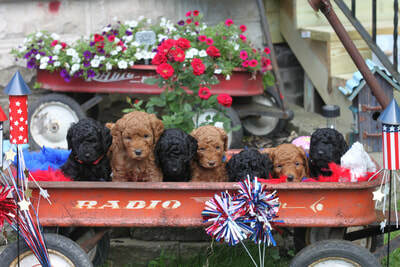 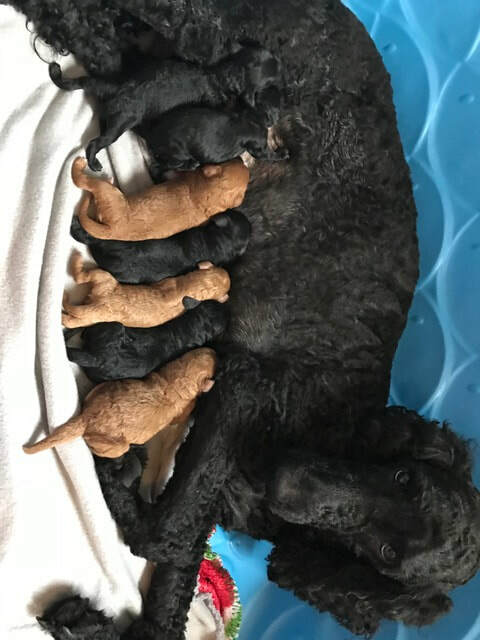 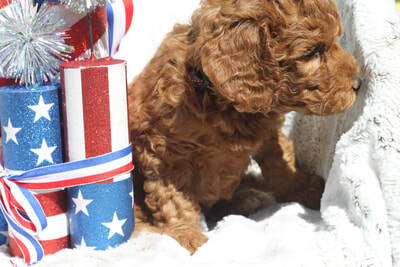 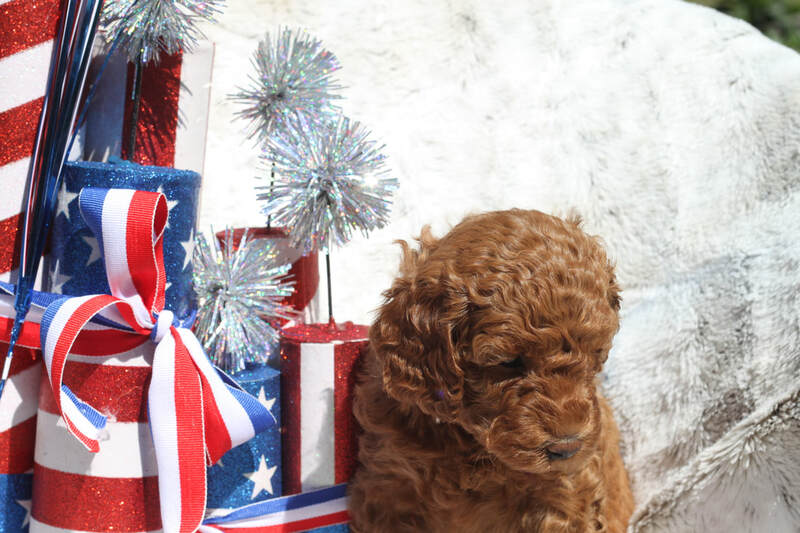 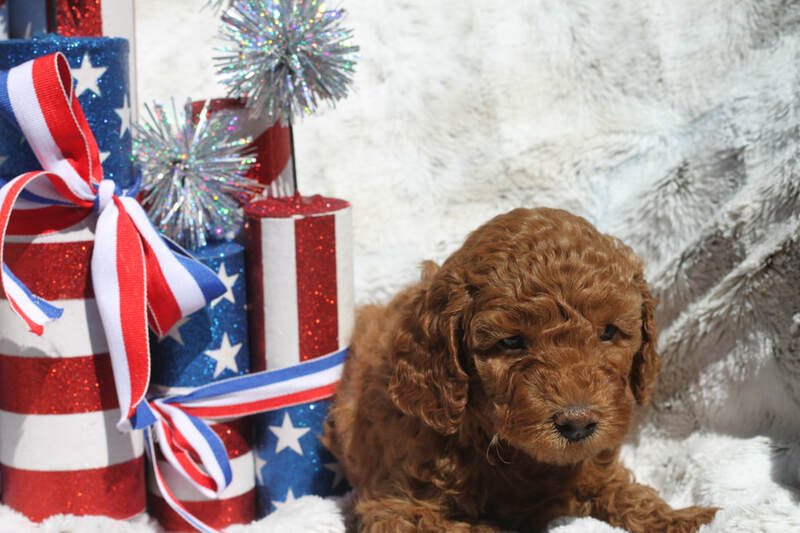 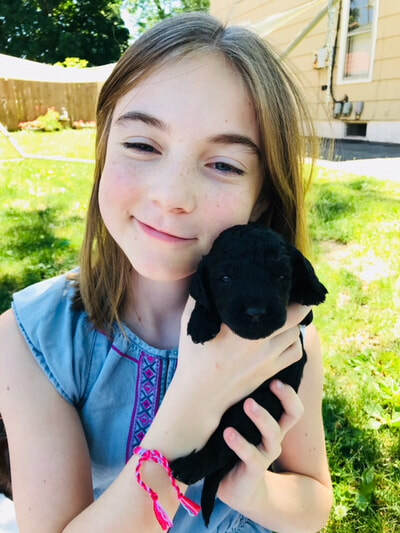 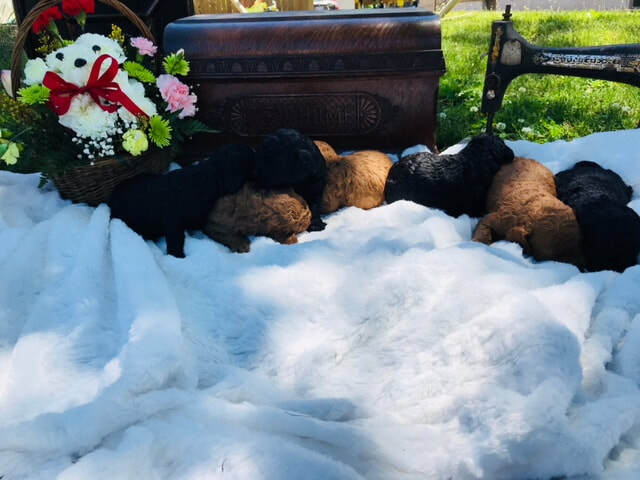 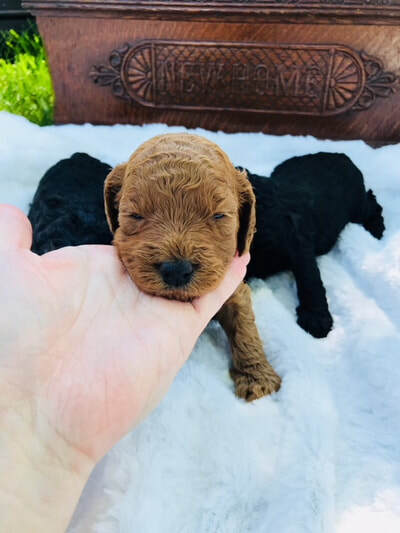 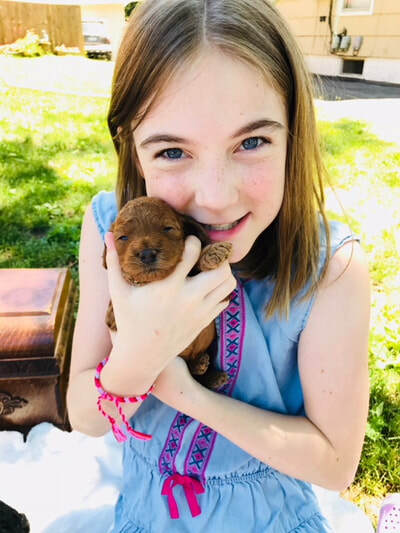 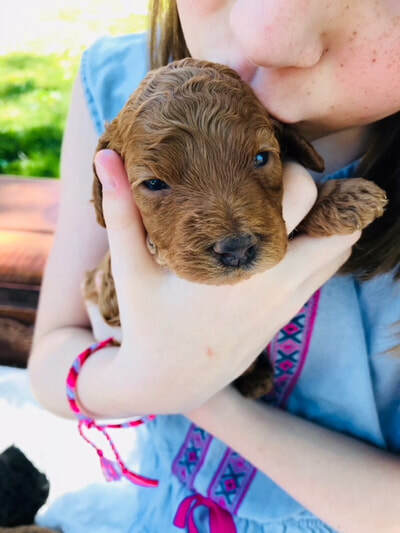 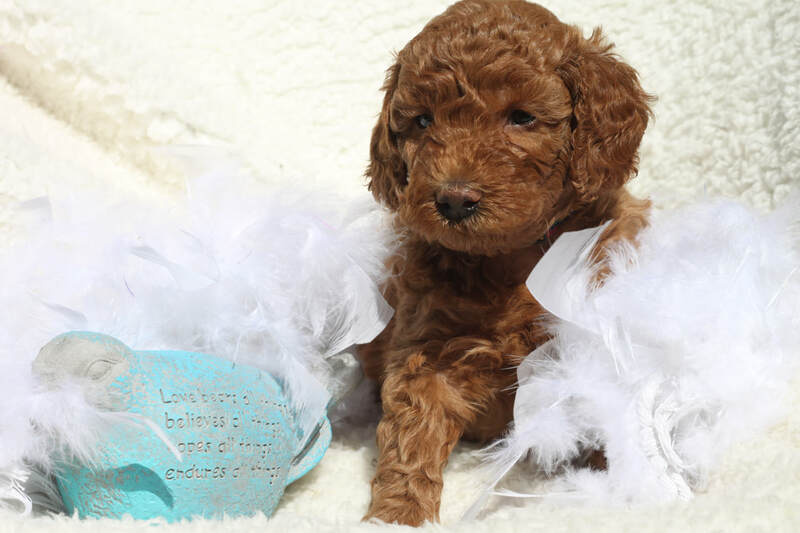 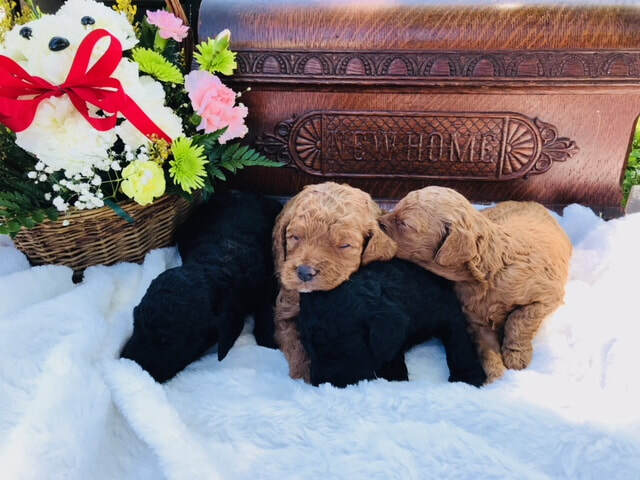 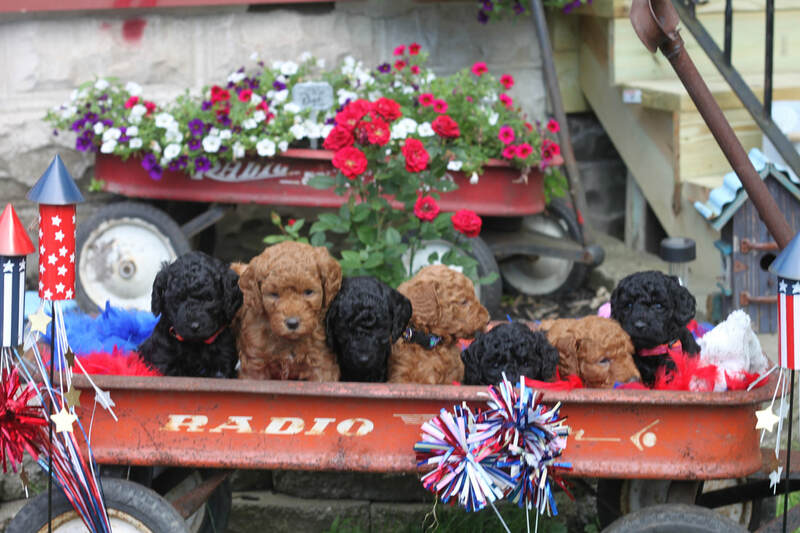 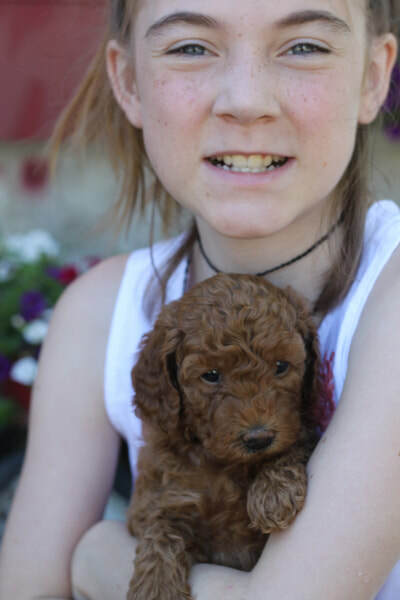 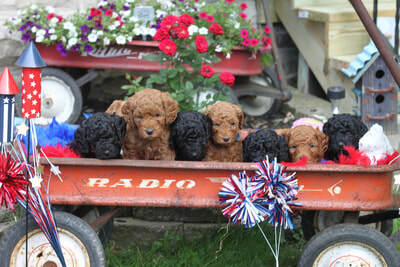 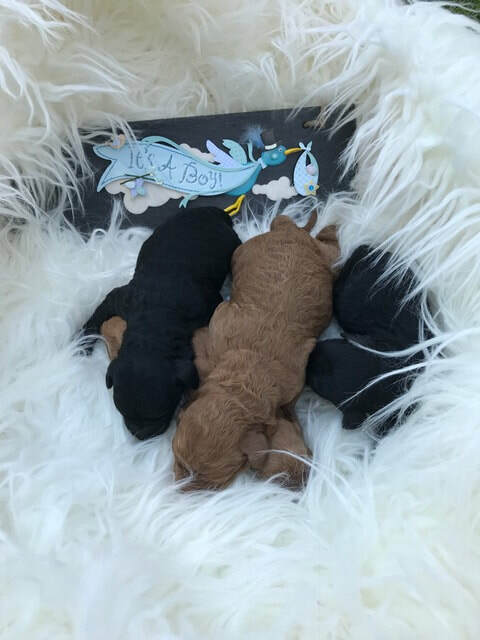 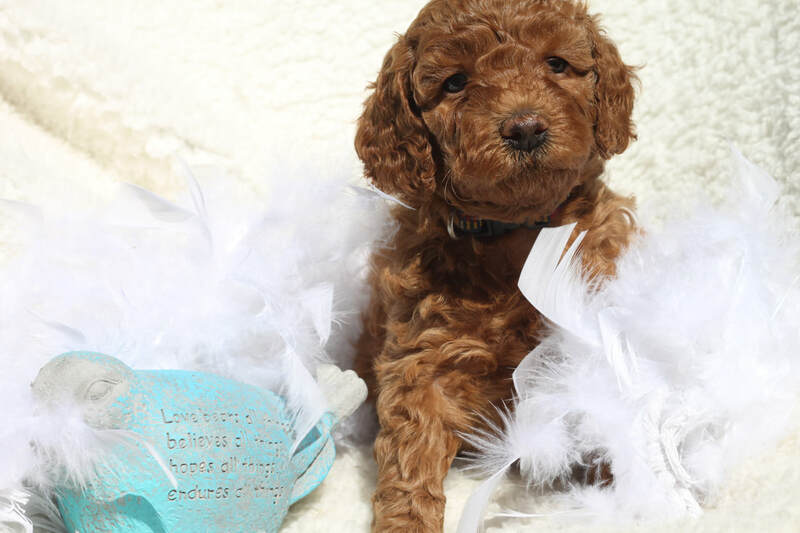 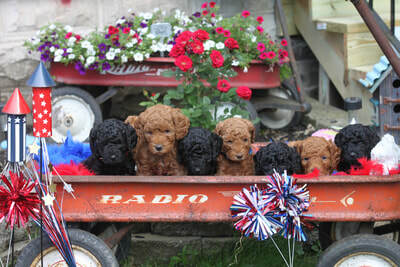 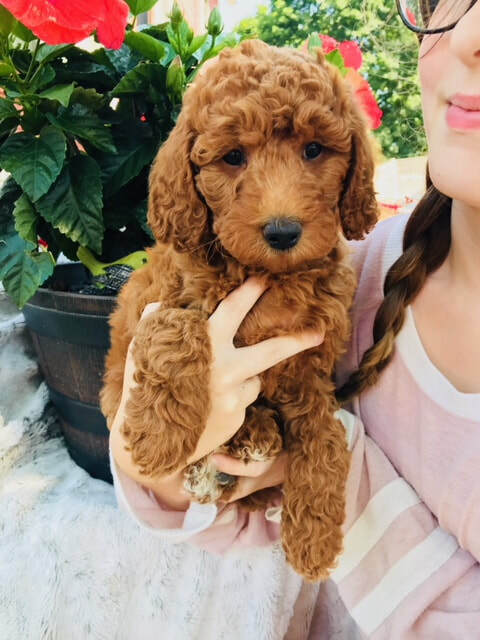 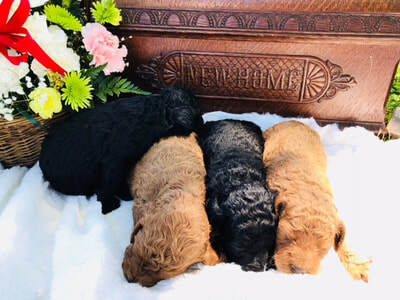 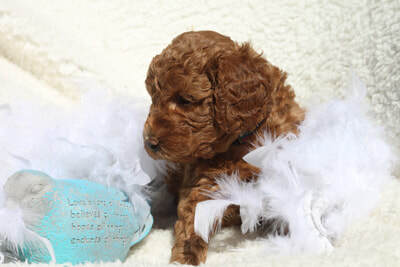 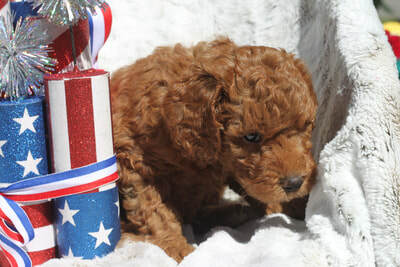 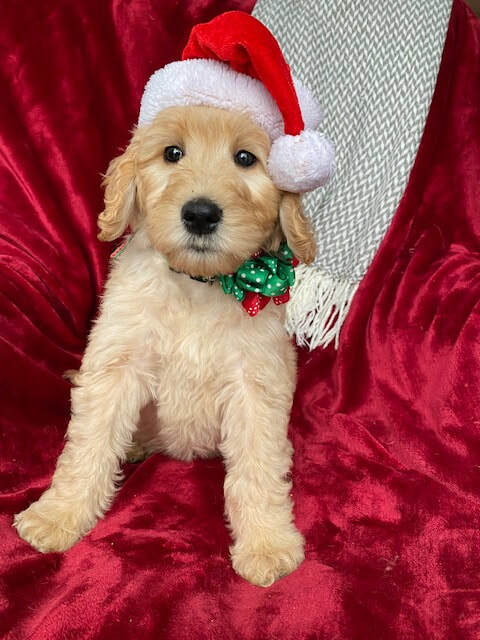 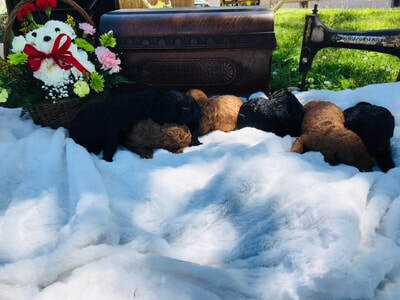 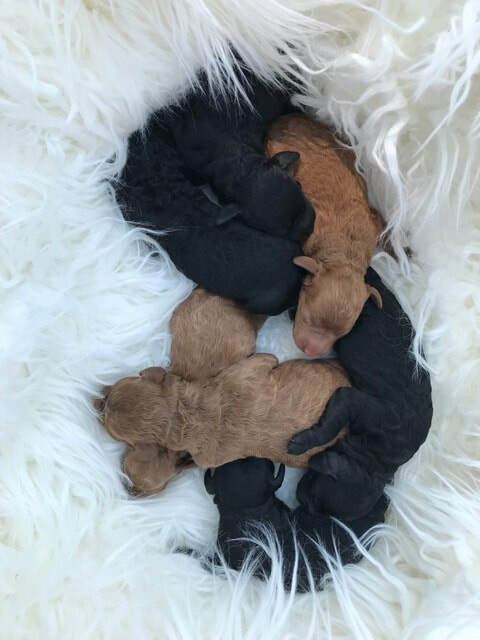 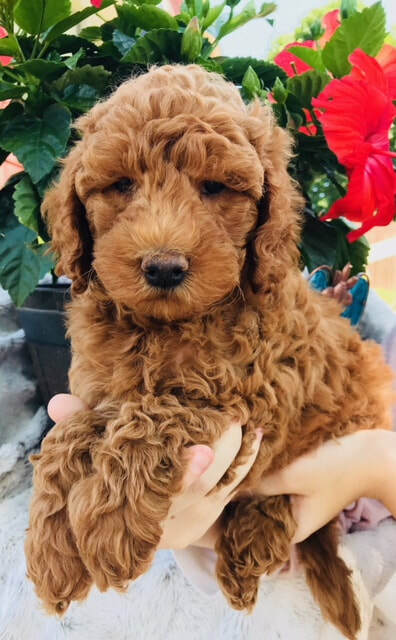 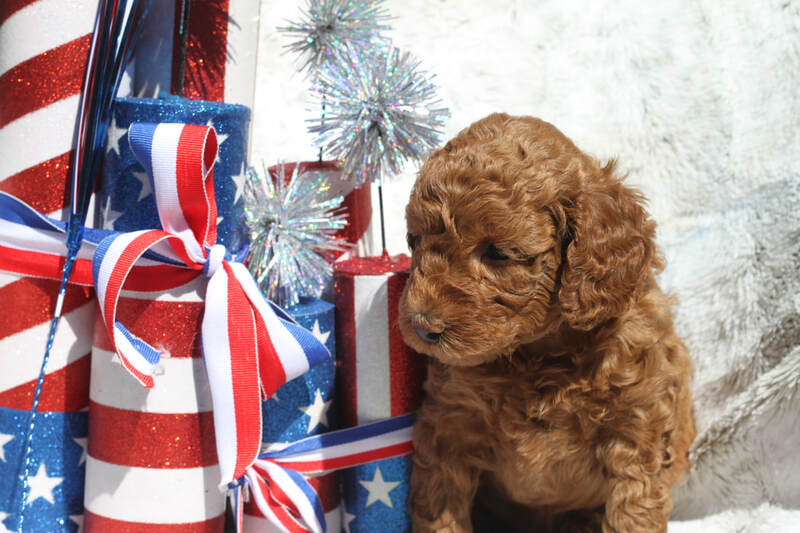 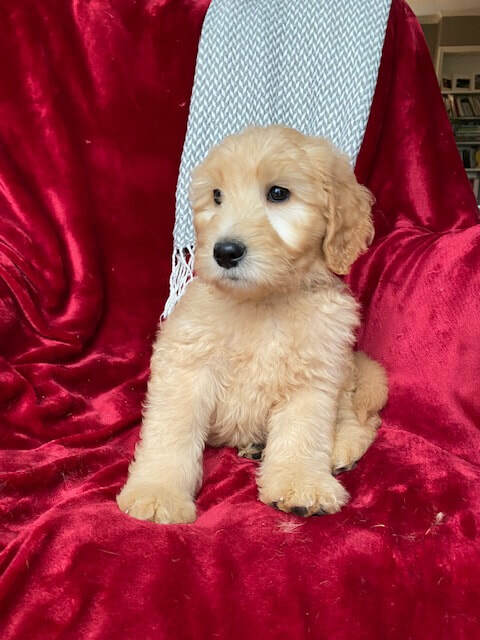 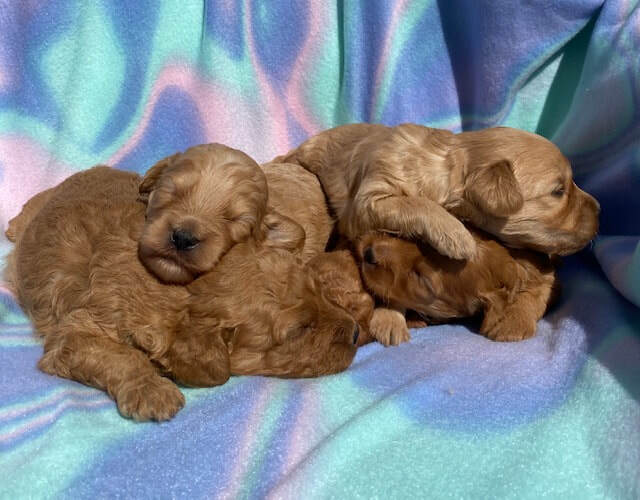 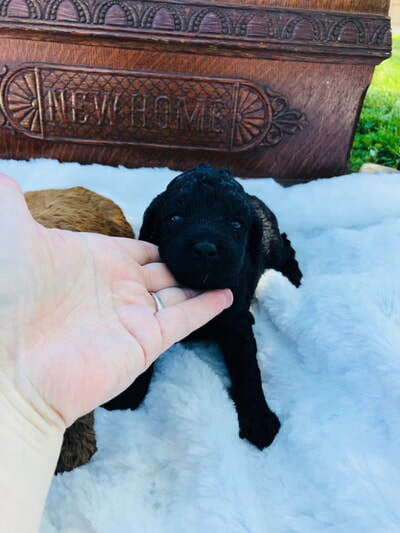 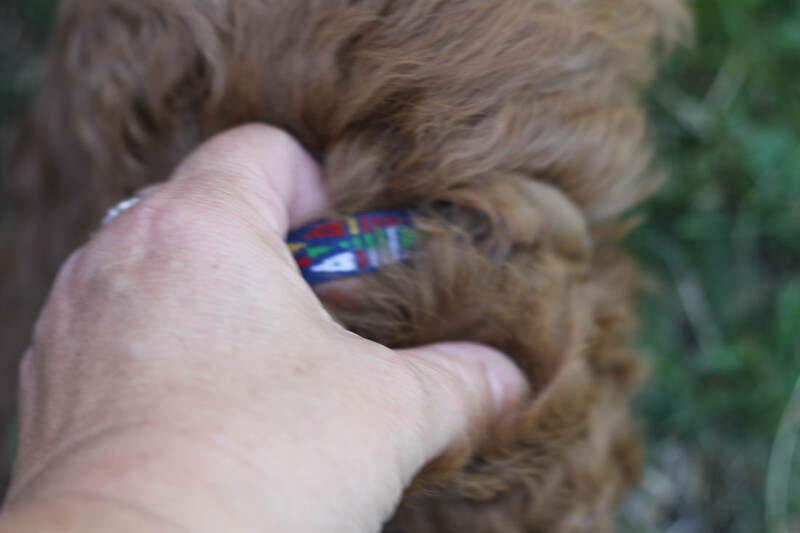 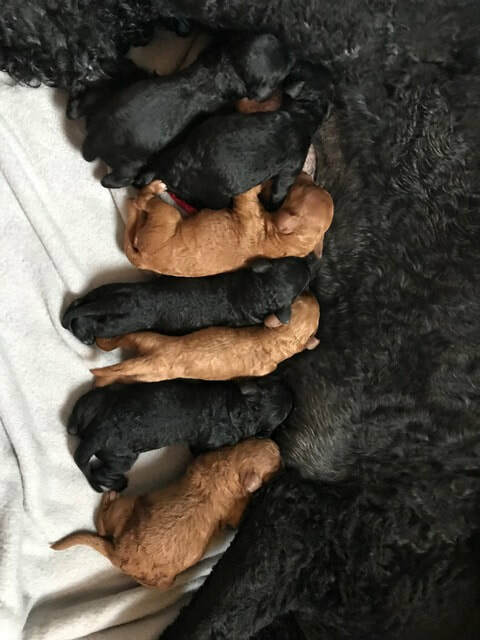 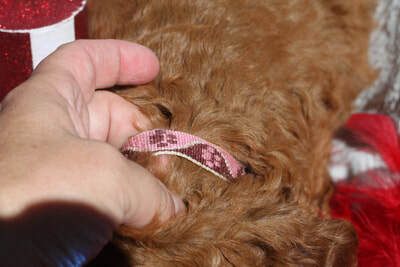 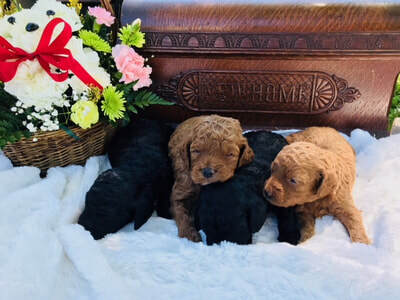 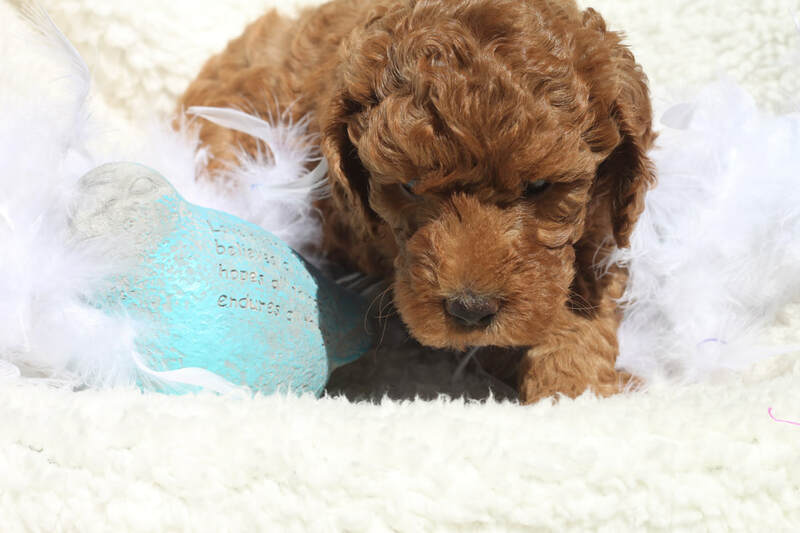 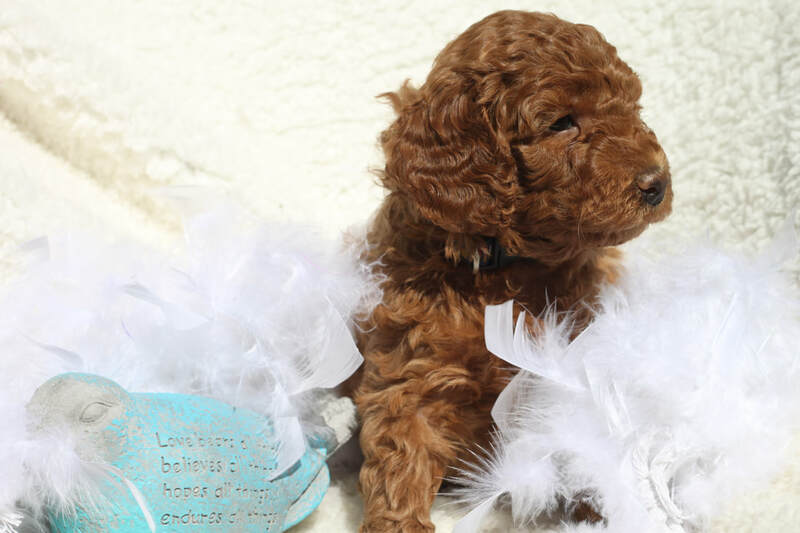 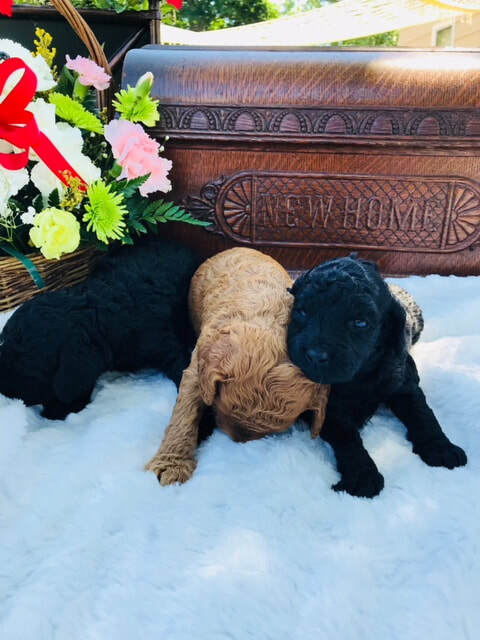 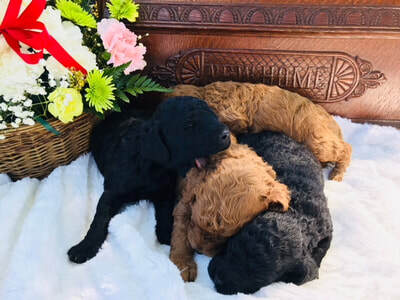 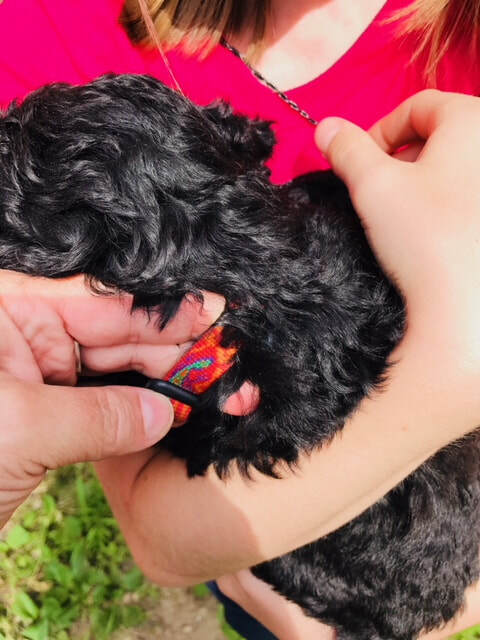 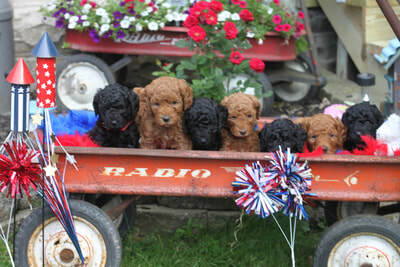 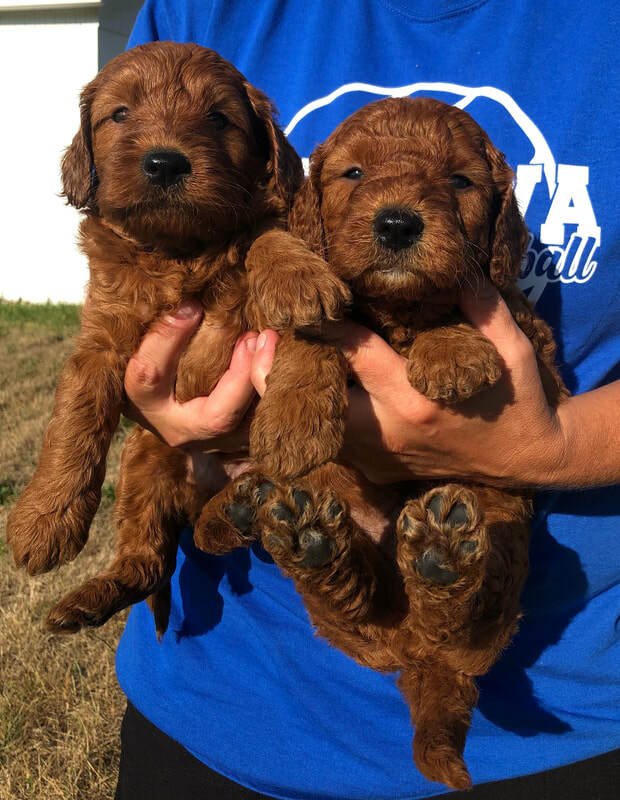 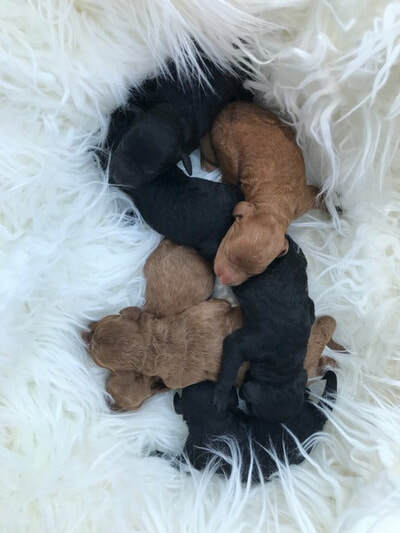 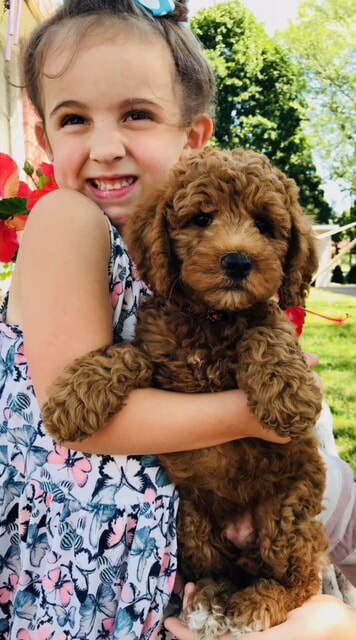 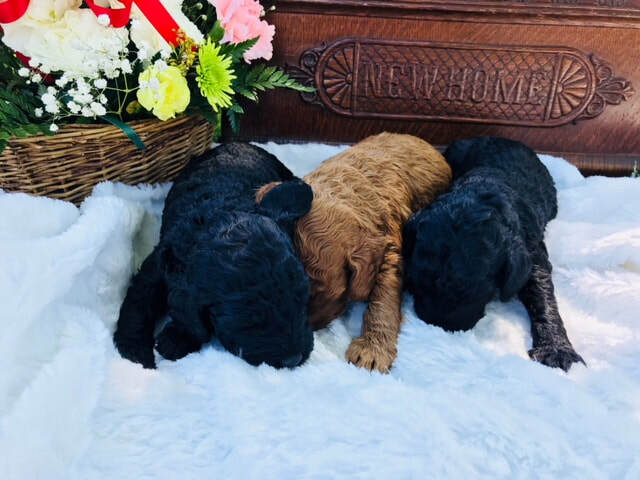 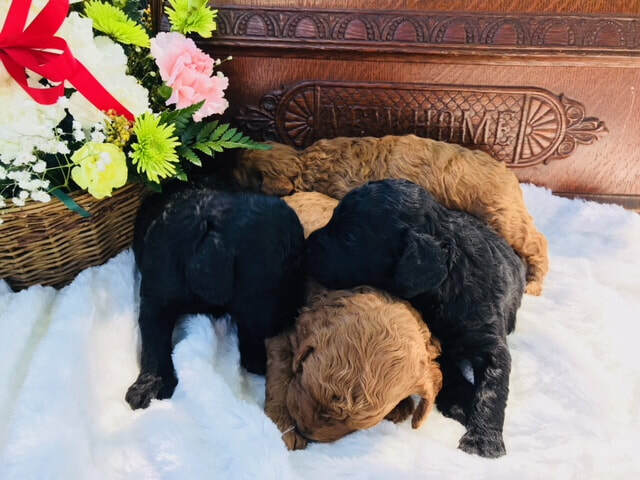 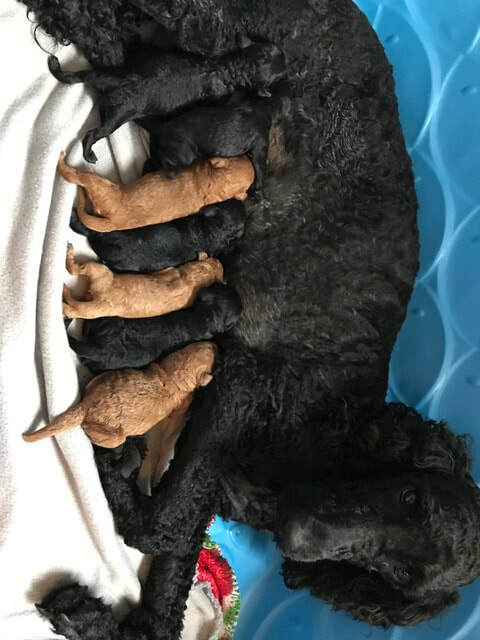 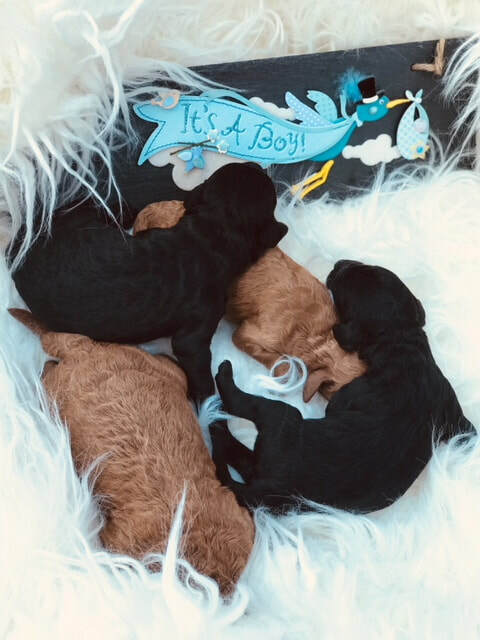 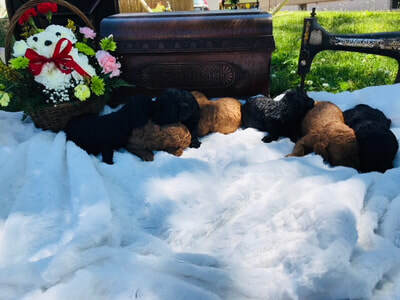 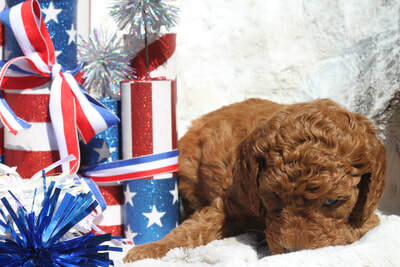 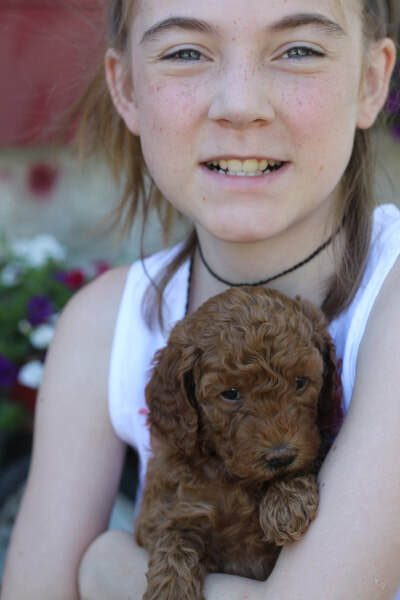 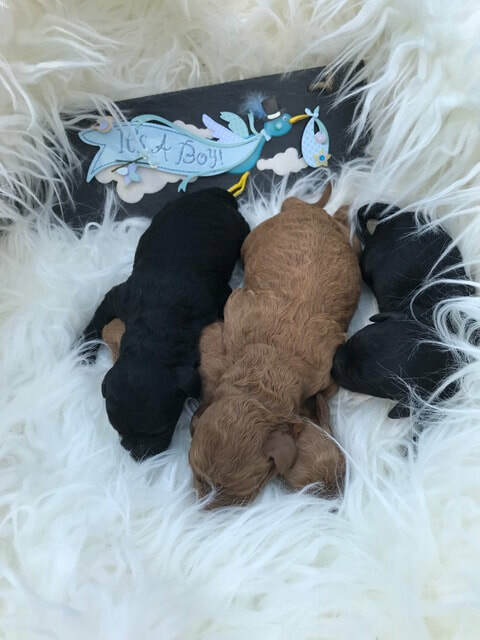 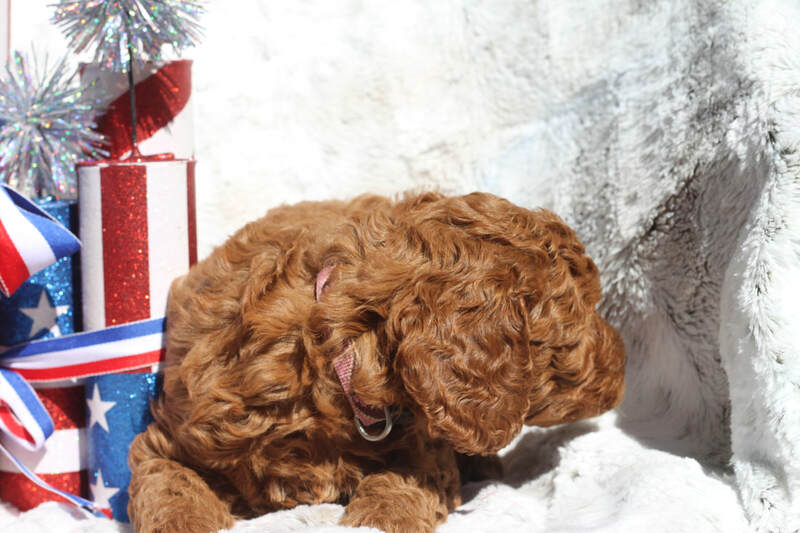 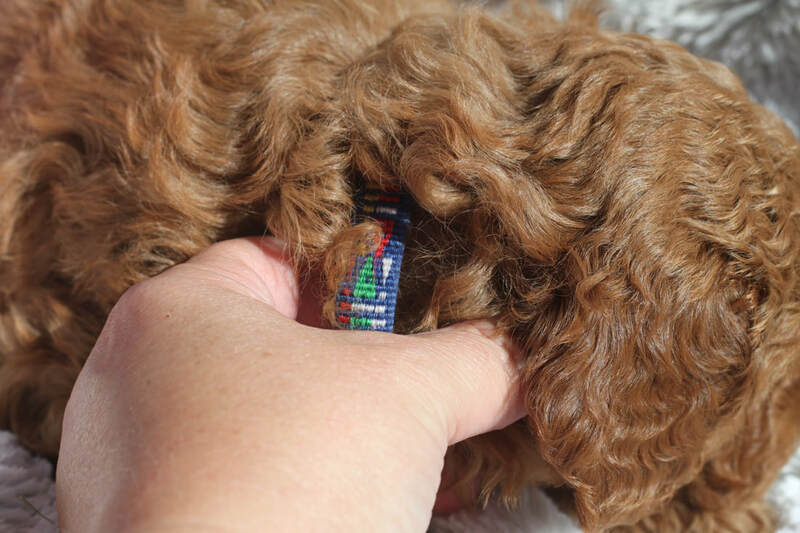 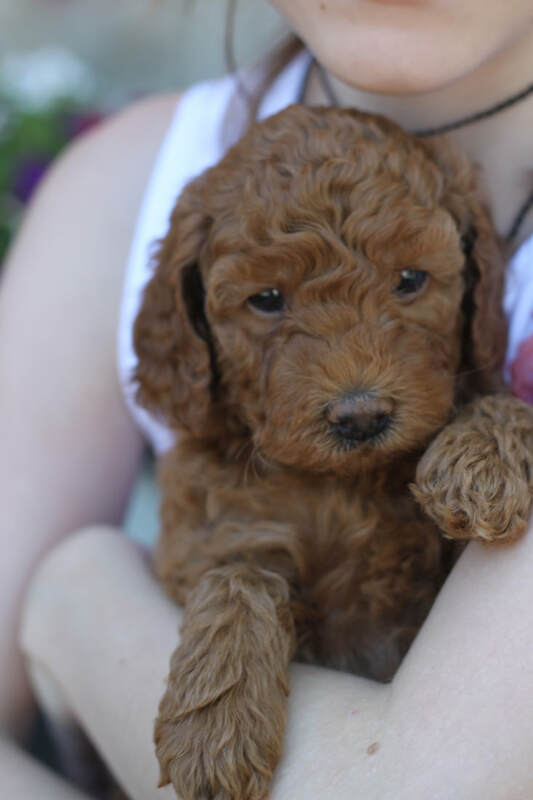 These F1bb Goldendoodle puppies will most likely be curly and probably weigh around 25 to 35 lbs as adults. 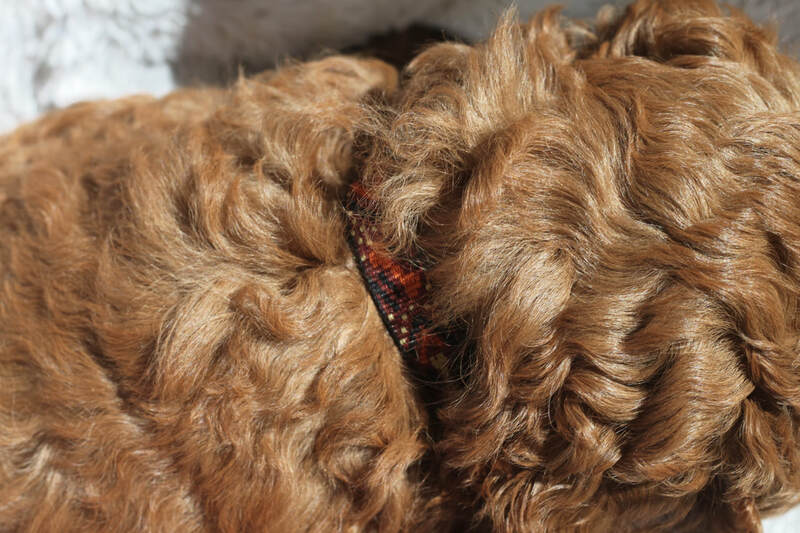 We cannot guarantee adult size, coat style, or color. 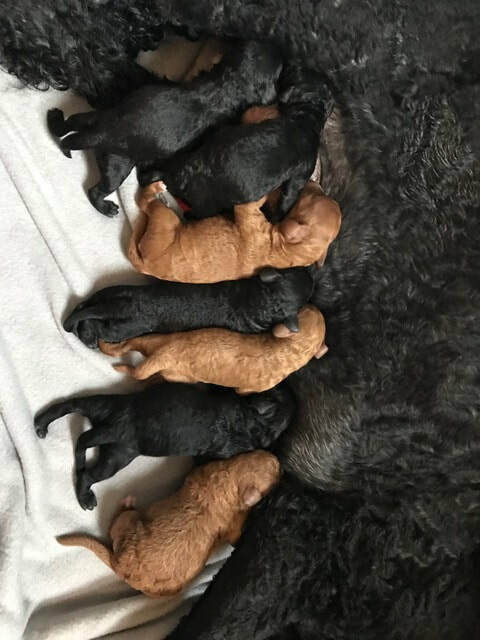 Sister Carrie's puppies - raised by her and her kids. 1. 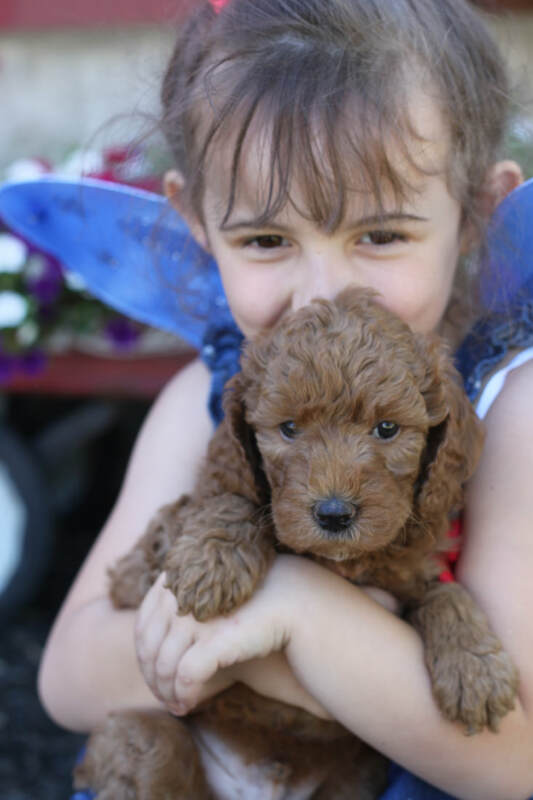 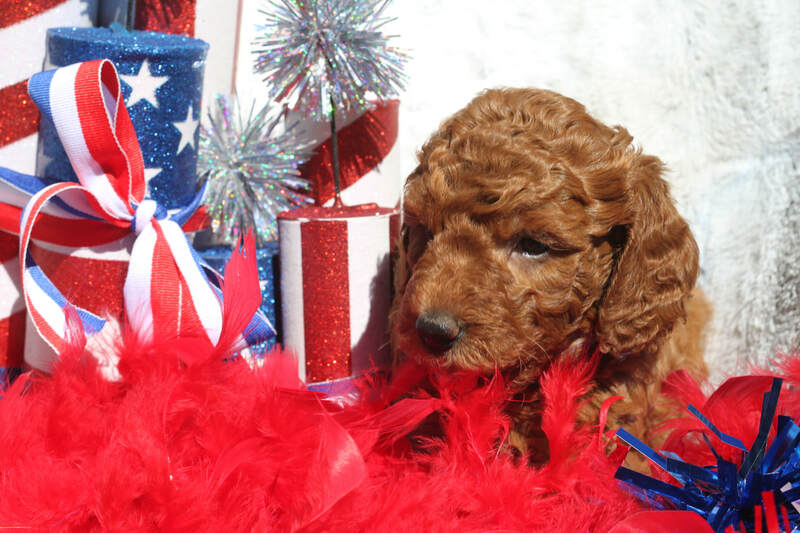 C. Sullivan, SmithtownNY/PDINFULL, red - GIRL, delivery Newburgh 7/29 - Pink paws "Lily"
2. 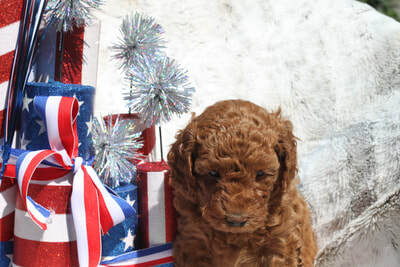 E. Scott, NYC/PDINFULLv, red - Boy, training until 8/26 - Guppy boy "Clifford"
3. Metzler, PDINFULLp, Boy, coming 7/28 but stay training 2 mnths, red swirls boy/black "Finley"
4. J. Dann/Cohen, PDINFULLv - largest black girl, delivery Newburgh 7/29 - Pink girl, maybe "Piper"
5. 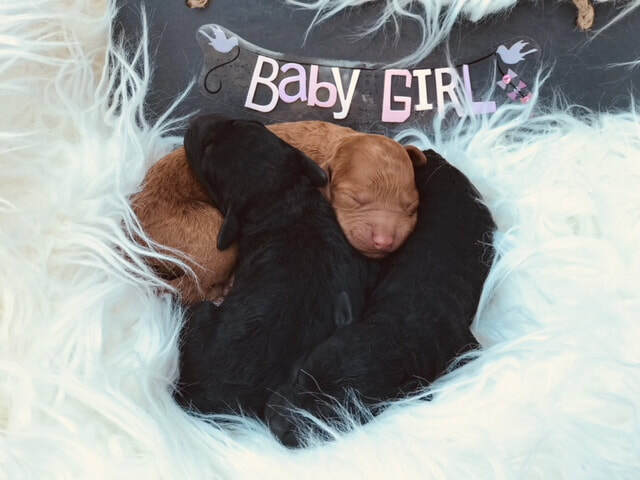 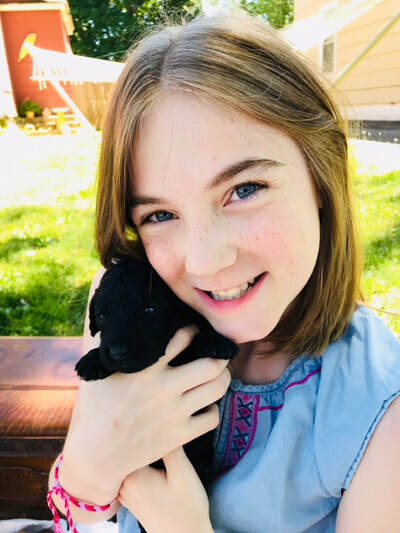 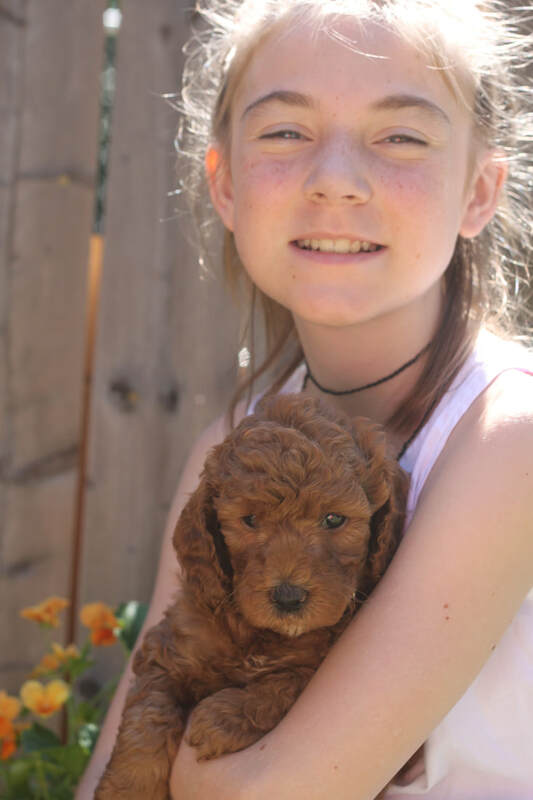 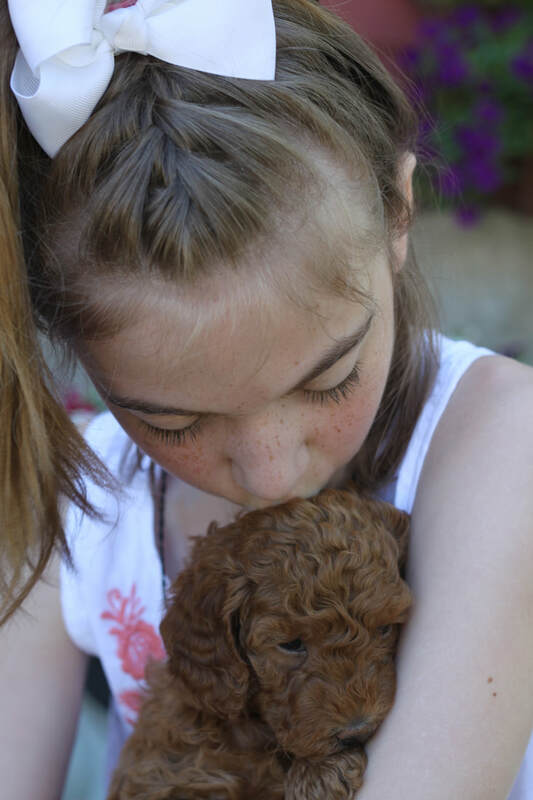 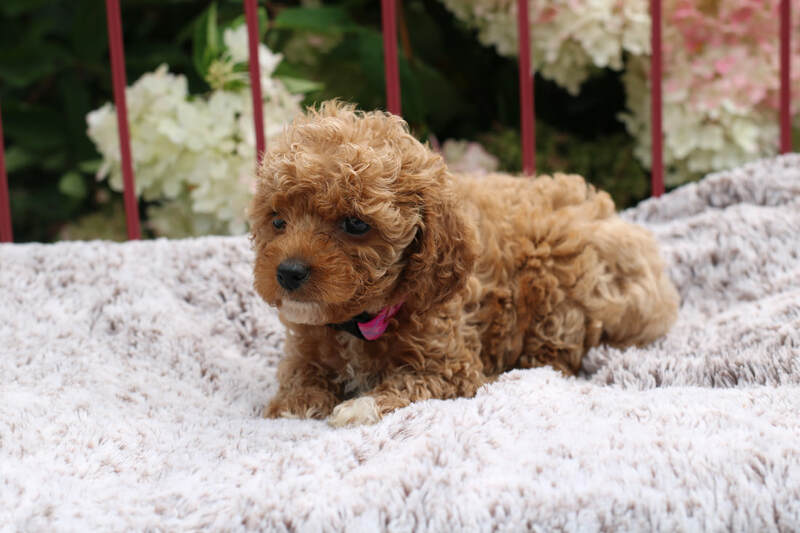 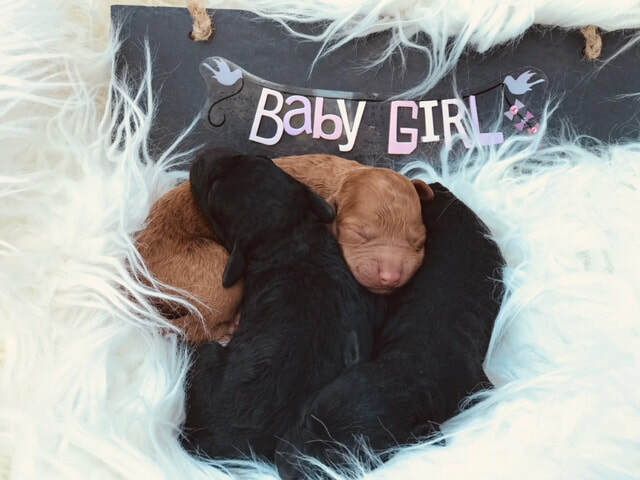 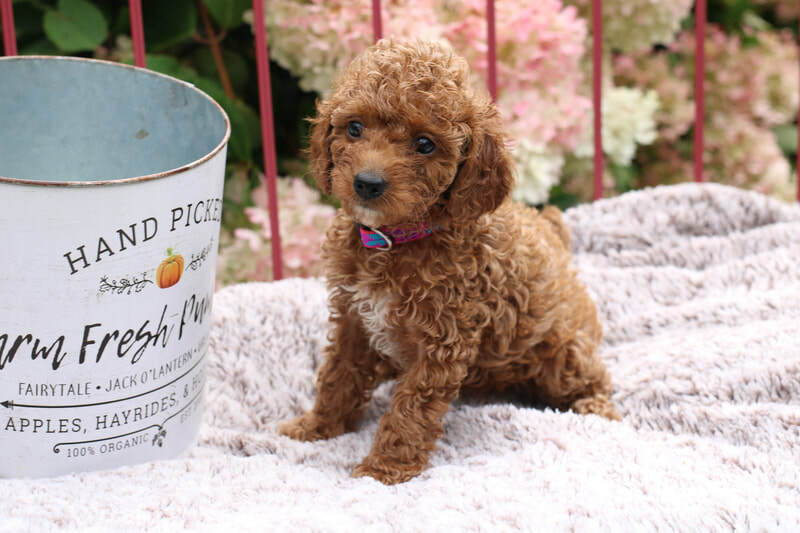 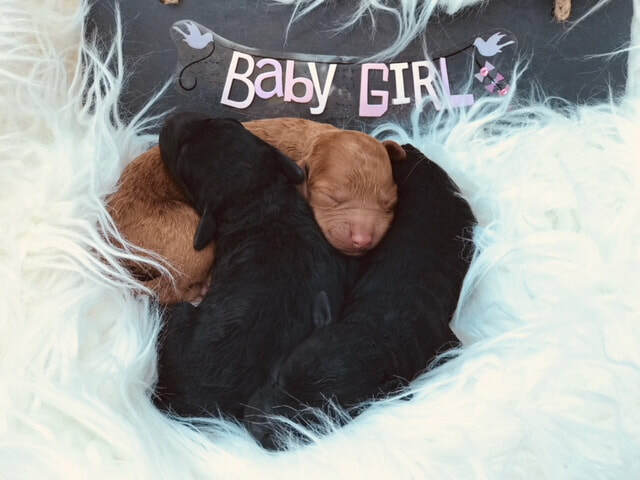 Pelliccia - owner of RVD pup, PDINFULLp, black girl - Orange raindrops girl "Evie"
6. 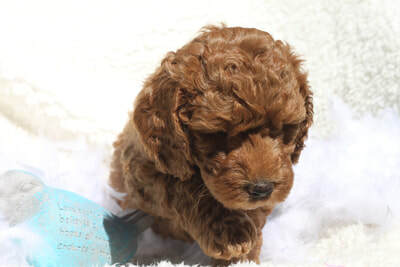 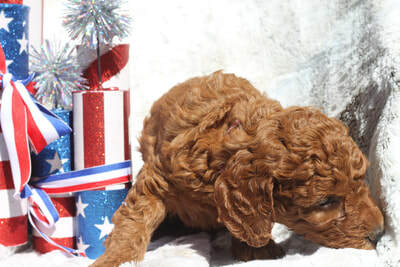 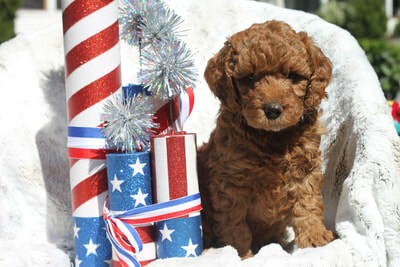 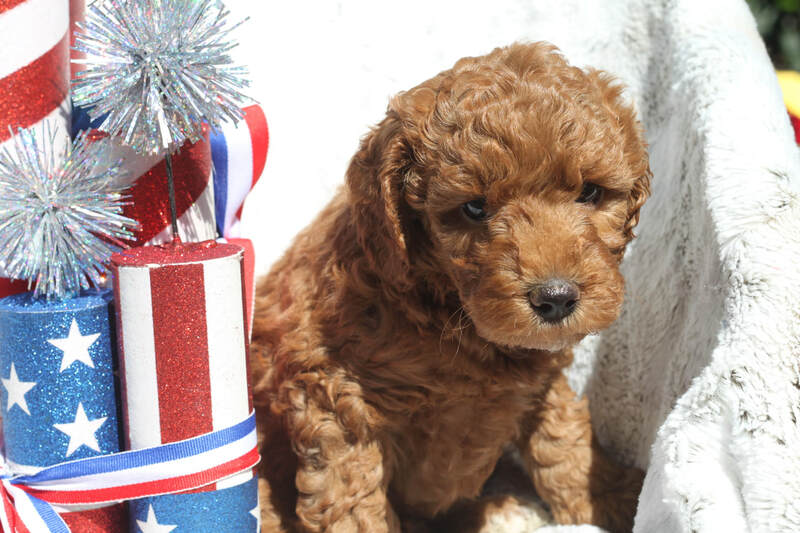 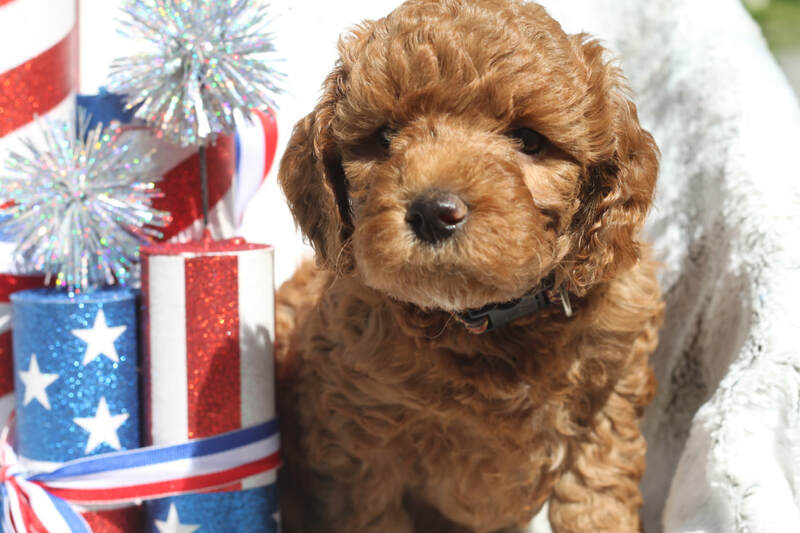 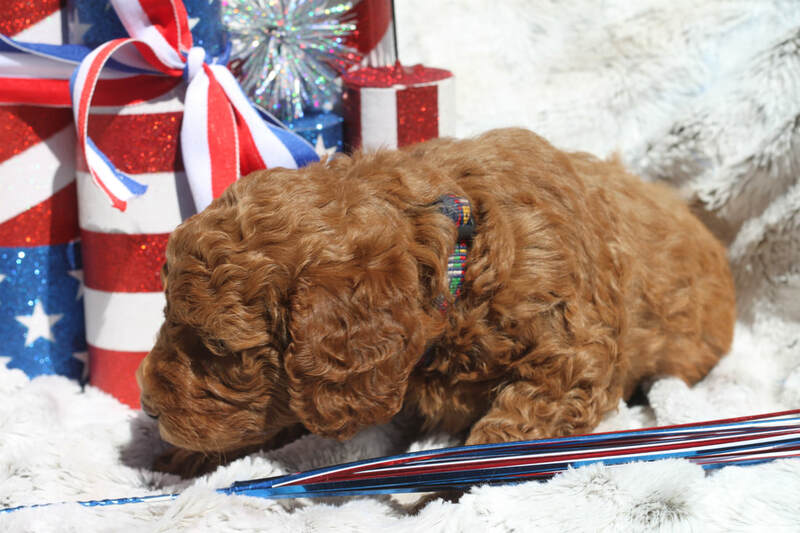 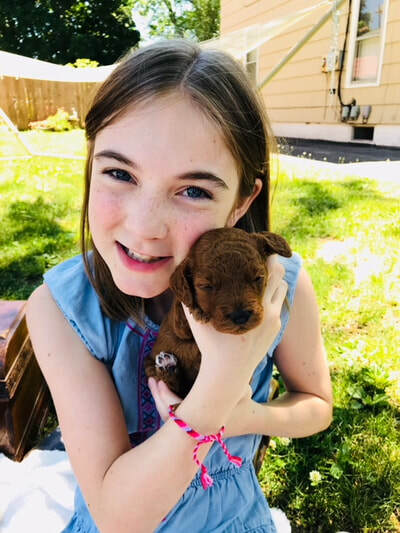 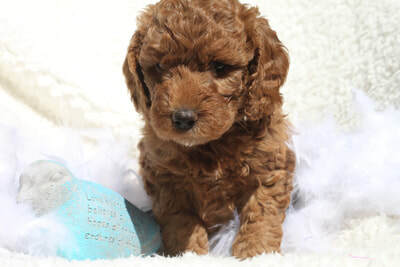 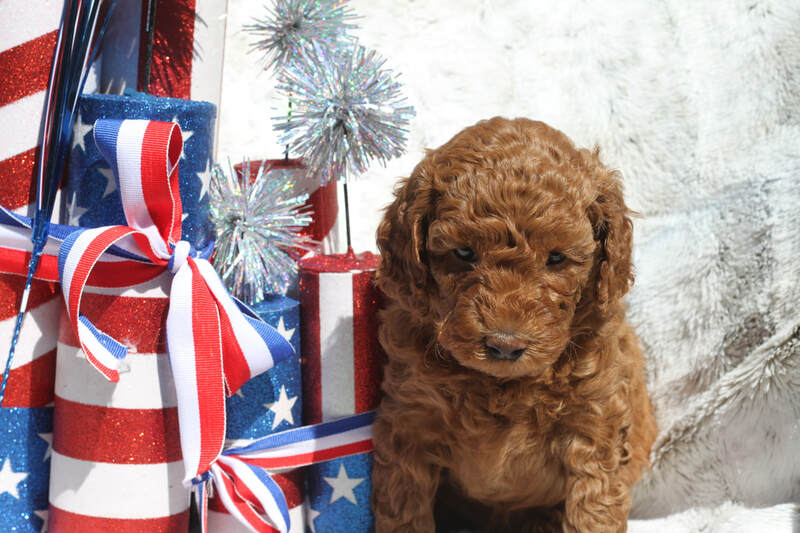 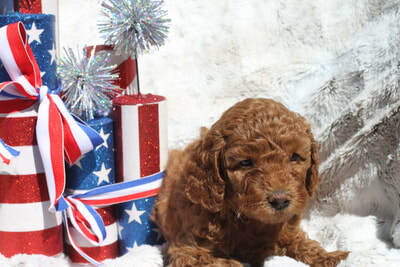 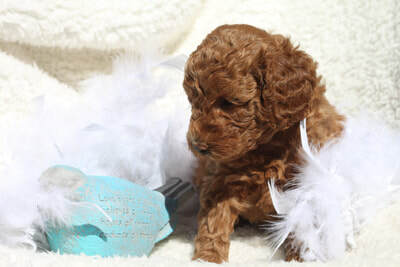 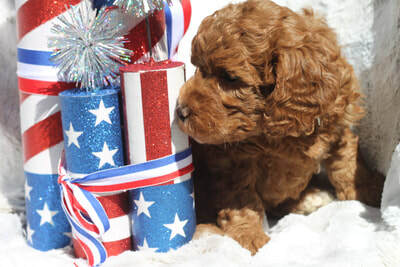 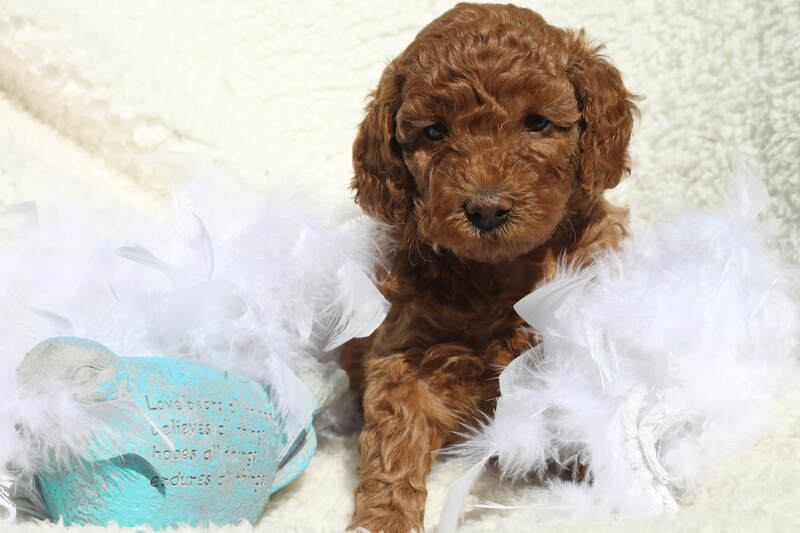 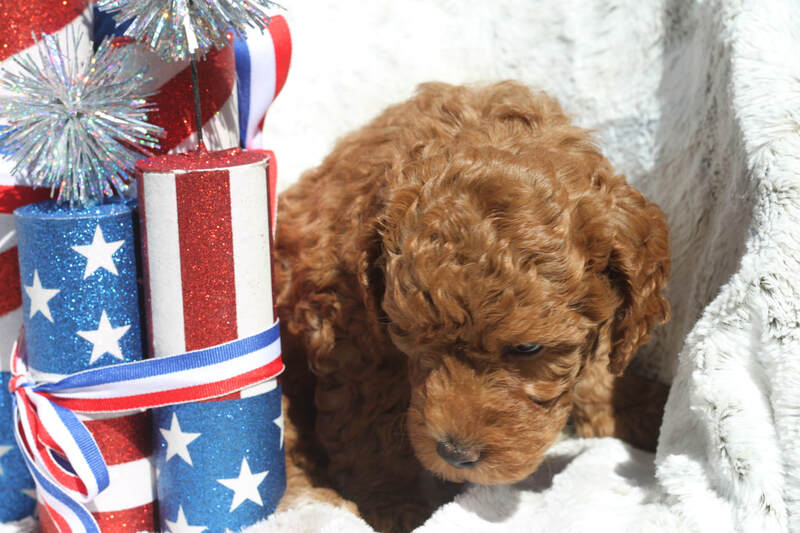 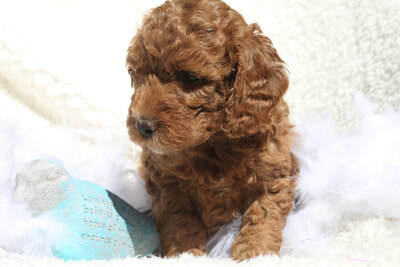 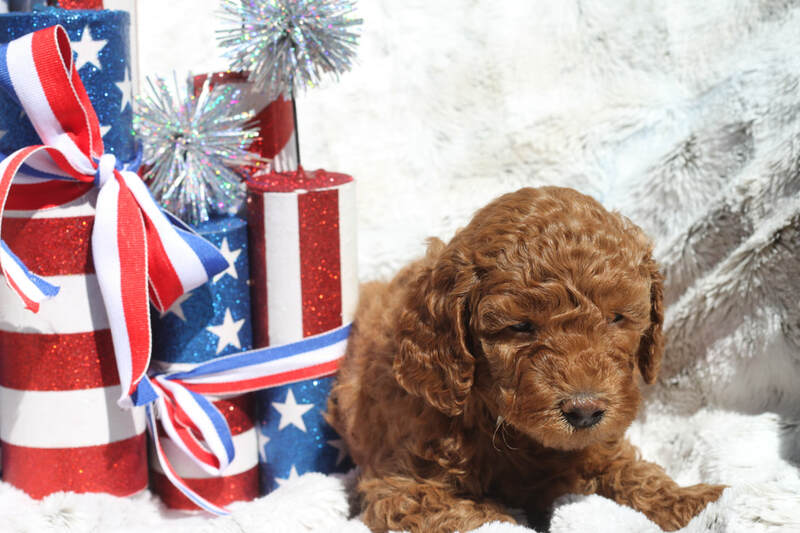 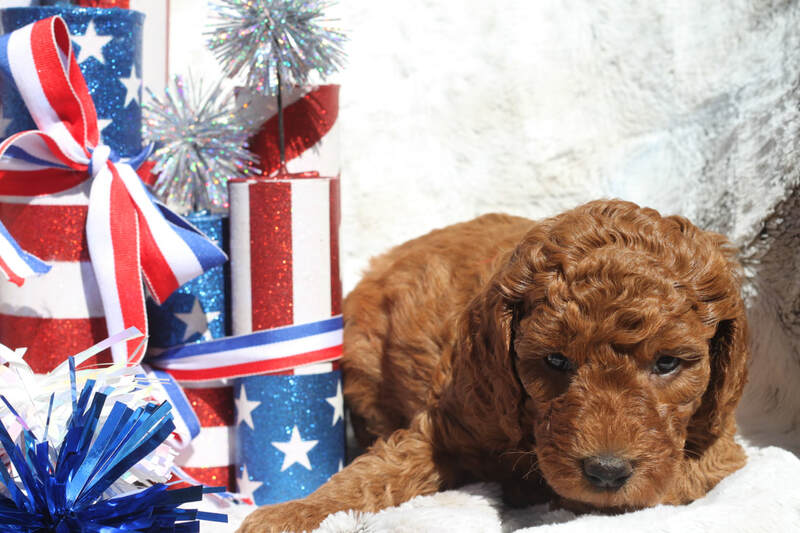 Tartara, NJ - PDINFULLck, red coated boy, Brown bones , delivery New 7/29 "--"
7. 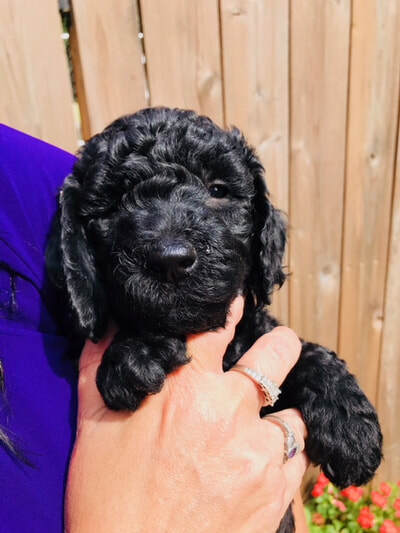 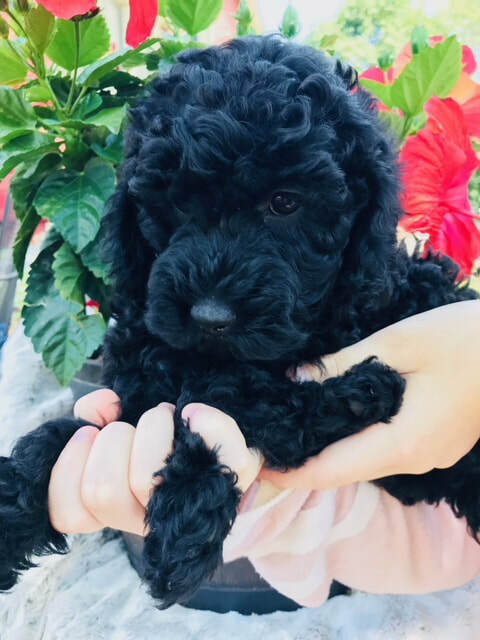 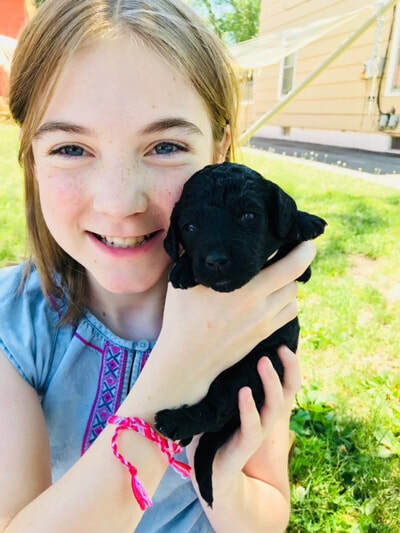 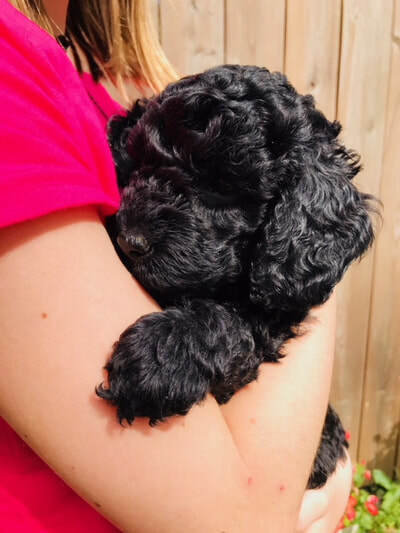 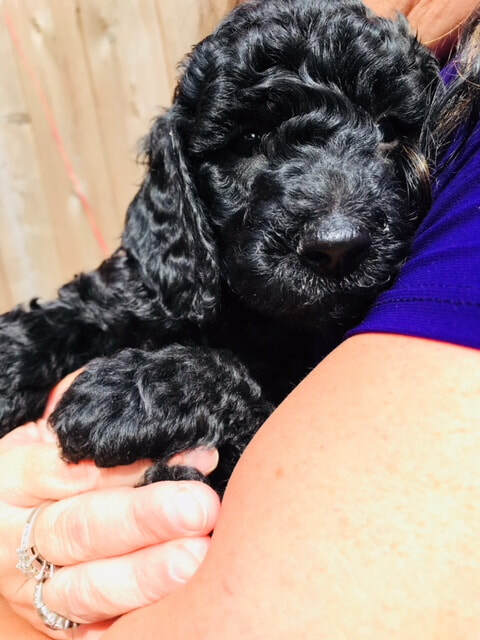 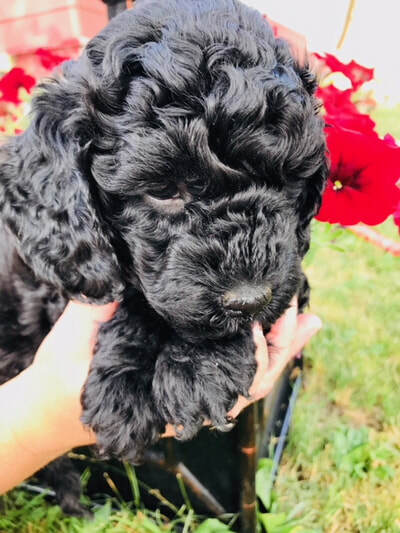 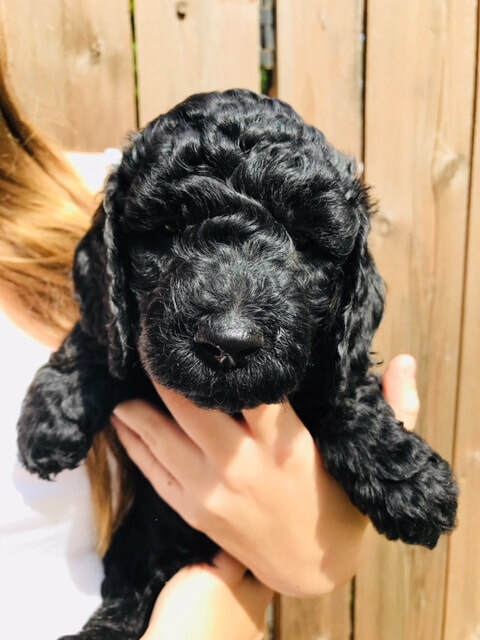 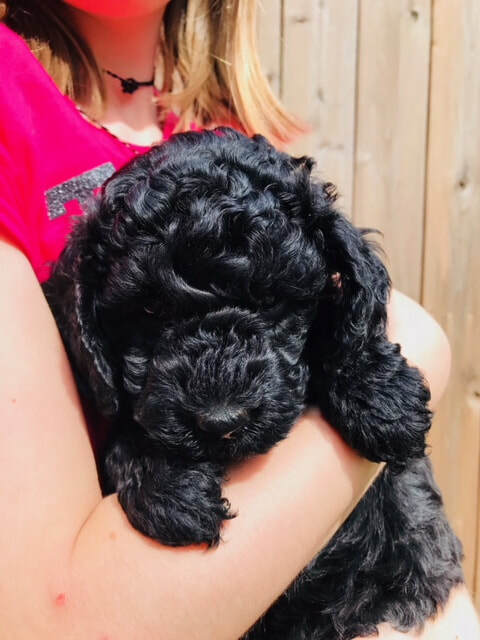 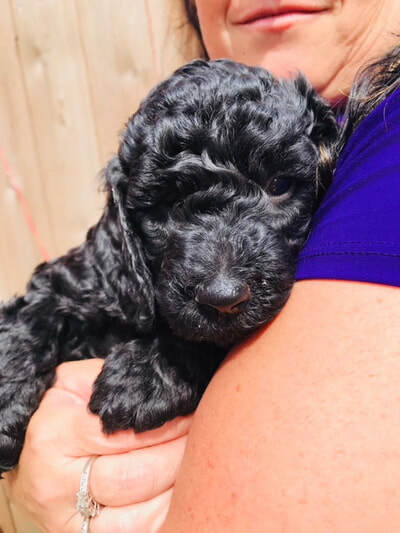 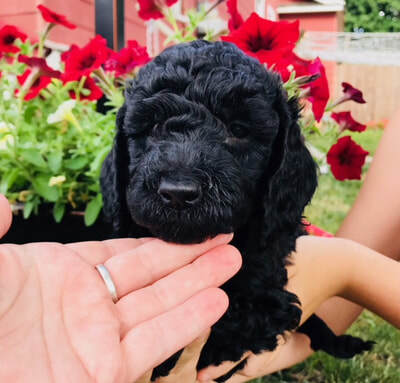 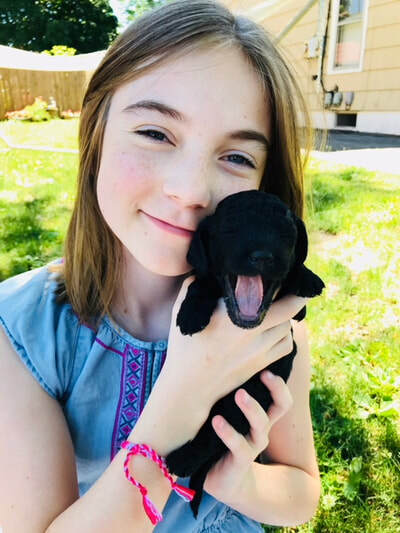 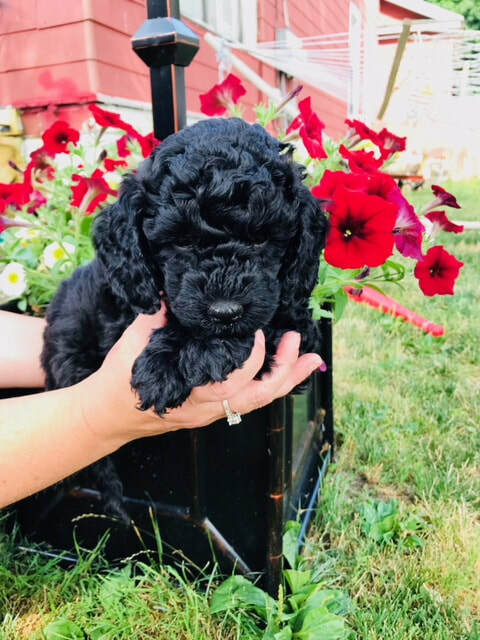 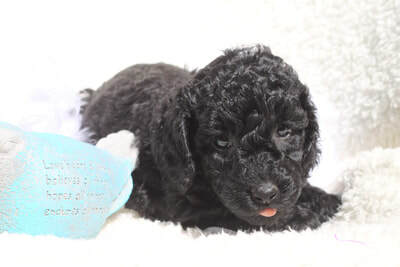 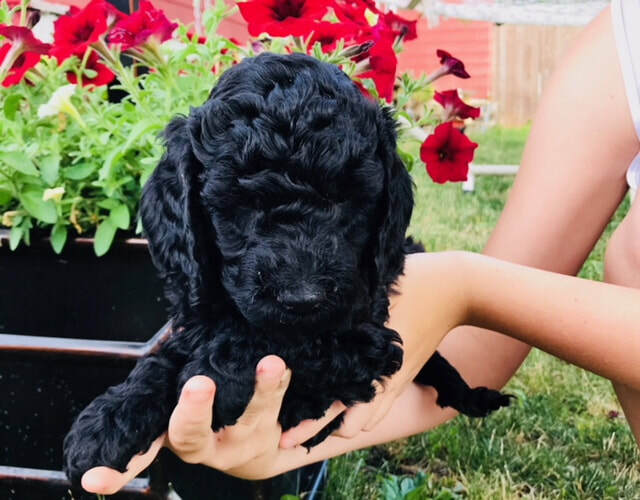 Ford - PDINFULLck, black coated boy, Orange gummy bear - the Fords "Bailey"
Let me know if coming on the 28th or if you want to do it via Facetime/Skype and delivery option on the 29th to Albany/Newburgh. 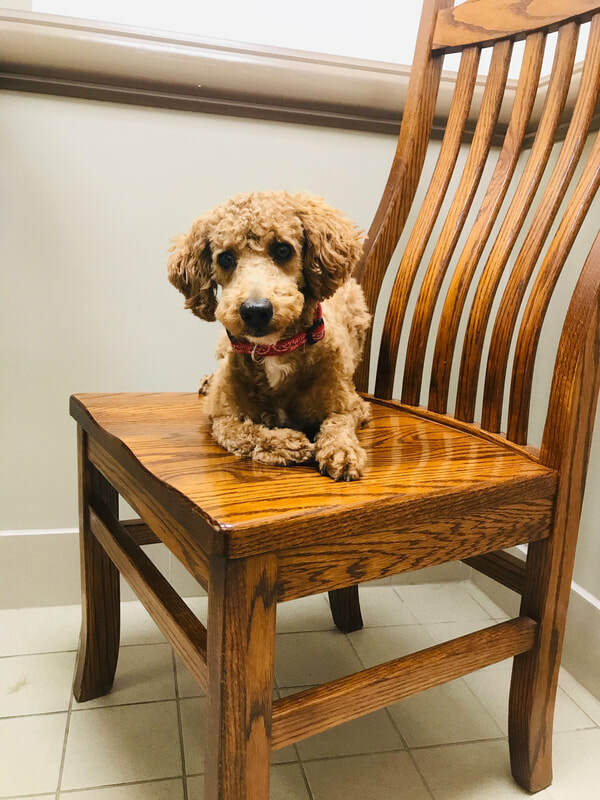 ​Vet visit went well. 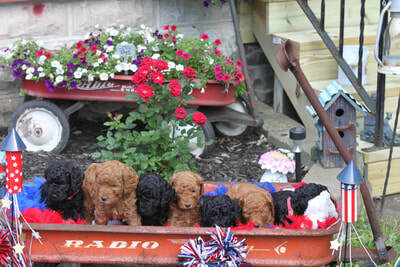 No issues to report - all are great....they received first set of vaccinations. 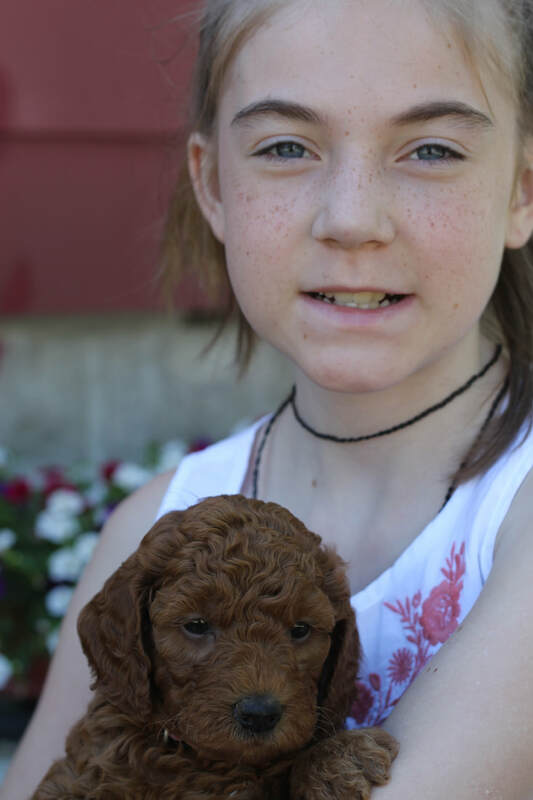 We will provide this documentation in the folder we give you. I'll post weights tomorrow.